It’s a good month for training, but I appear to have lost my screenshot thereof. Still, the drills stretch on interminably, and news of a rebel concentration suitable to attack is a welcome diversion. 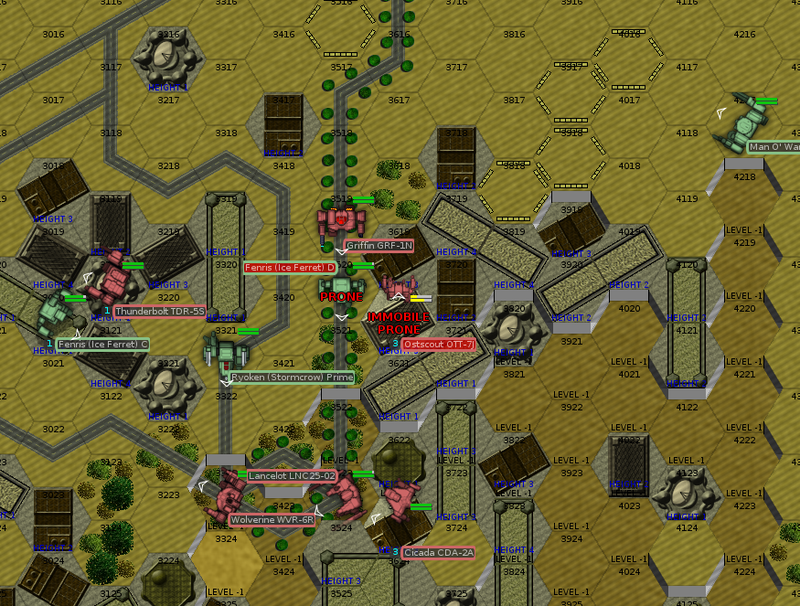 The enemy is a reinforced Vedette platoon, six tanks and two medium mechs of indeterminate make, currently stationed in a town. Weather is bad; high winds rare reducing weapon accuracy and hampering vehicle movement. The enemy deploys in the city, where the tight quarters will work to their advantage—and ours. 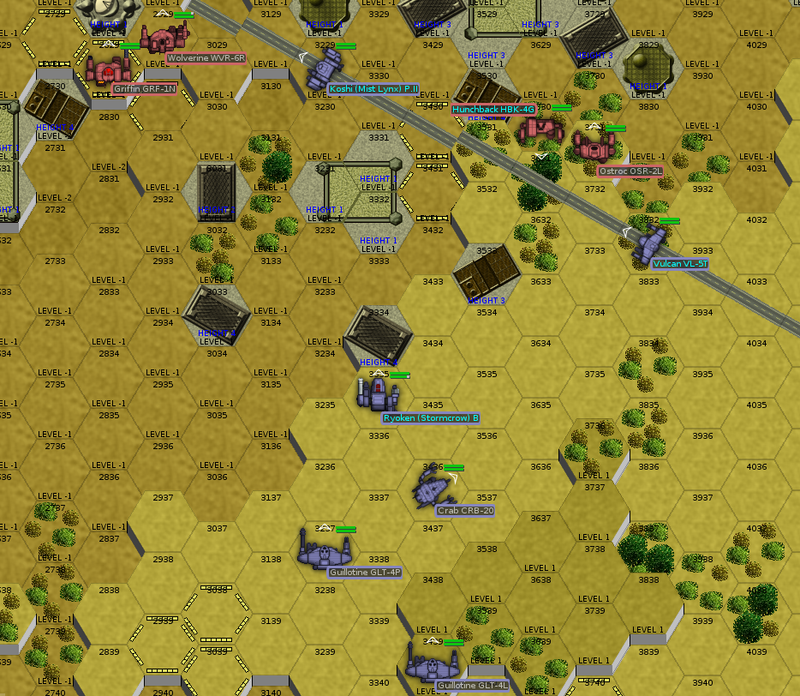 Bear’s Bruisers move north to deal with the enemy Wolverine, while Drake’s Destroyers swing around south to march through the center of the city. Both of the Bastards’ lances advance. Almost nobody is within weapons range at this stage. Hanzoku takes a crack at an enemy Vedette, while the first enemy medium mech, a Wolverine, fires on Euchre‘s Trebuchet. The Wolverine scores the luckiest of lucky shots, clanging an AC/5 shell off of Euchre‘s cockpit. He shakes his head, bell rung, but forges on. 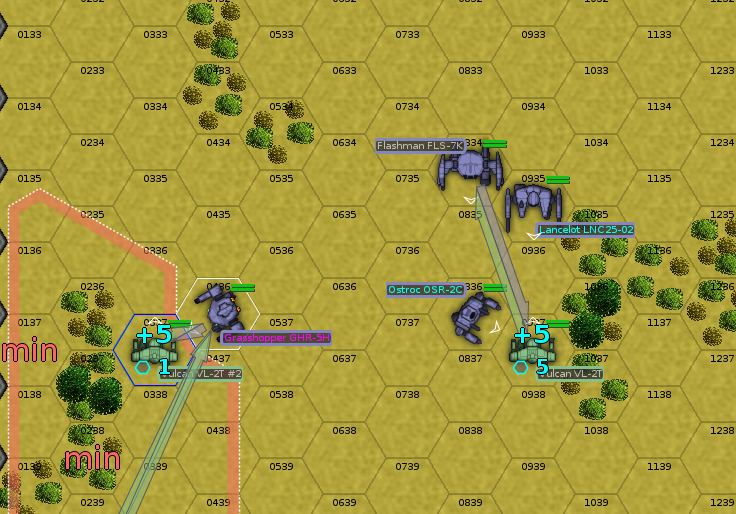 Bear’s Bruisers now have a number of good targets, but are good targets themselves, as both enemy mechs move out of the city and a Vedette runs at top speed down the road. 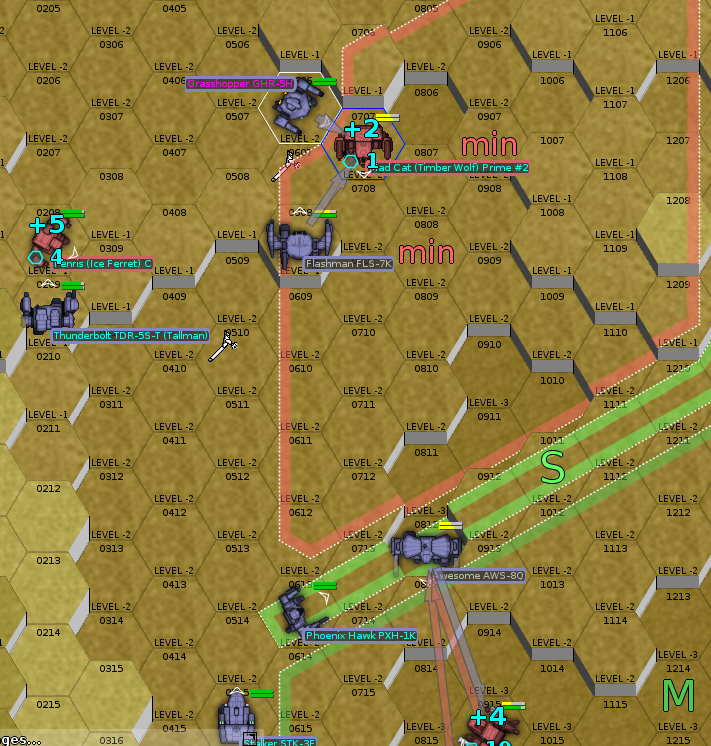 Drake’s Destroyers, under Carcer‘s command, aren’t in great position, and the weather means they’ll be a little slow to reposition. Blame your staff officer’s rustiness. The Bruisers concentrate on the Vedette, hoping to knock it out this round. Down south, Woad with his trusty Grasshoper is the only pilot with a shot. He lines up on a broken-down Vedette in the center of town and lets loose an alpha strike. Nothing hits to very much effect. 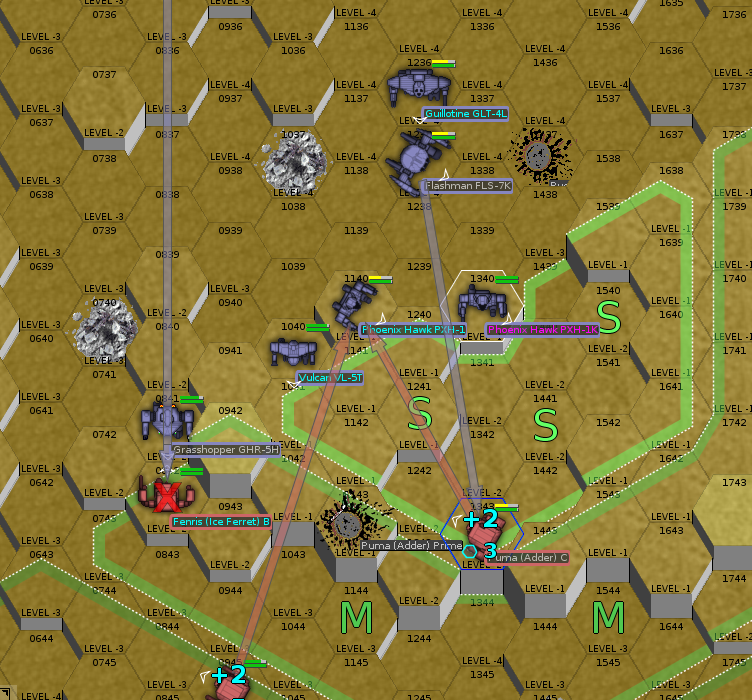 Severe scores with one of her Clan ER Medium Lasers, slicing into the Vedette’s armor. Woad hits his target with a single medium laser. The Wolverine and a Vedette score hits in response. Everything else goes wide or spatters harmlessly off of armor. In the south, the Destroyers split up. 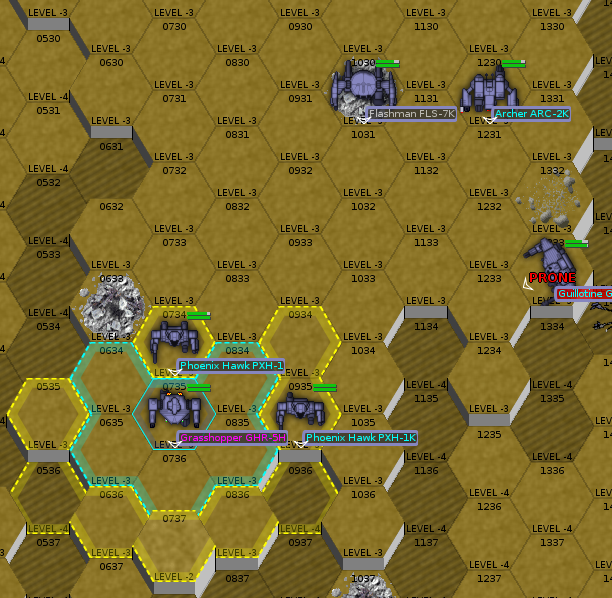 Carcer and Linebuster, with longer-ranged mechs, split out to the west, where they’ll be able to fire on enemies leaving town along the northwest road. 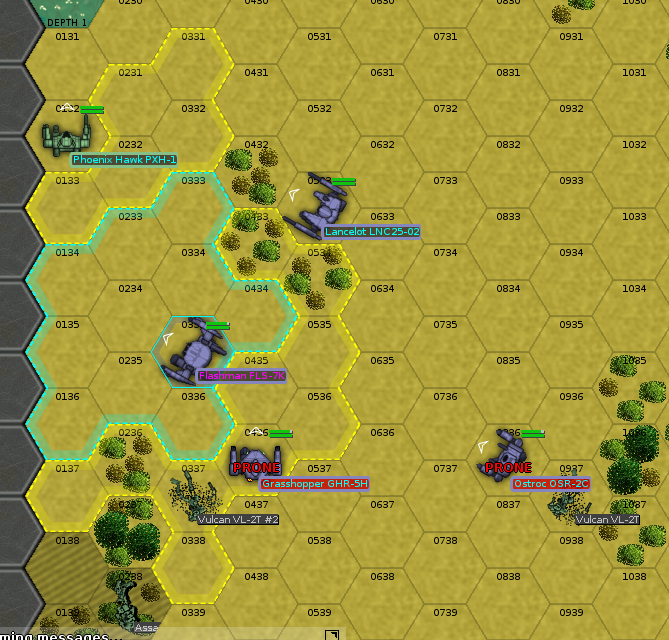 Woad and Blinky, in faster, shorter-ranged mechs, move into town to flank the vehicles hiding there. In the north, Severe and Teddy Bear aim to shoot at and stomp on the nearest Vedette, respectively, while Hanzoku trades fire with a Vedette poking its nose out of town and Euchre looks to deal some damage to one coming out along the northwest road. Four of Severe‘s five lasers find their mark, dealing a combined 24 damage, but Teddy Bear gets the kill with a stomp. Euchre damages his target’s left track, but doesn’t get the kill, while Woad and Blinky team up to knock out the immobilized Vedette in town. Blinky gets the last hit. 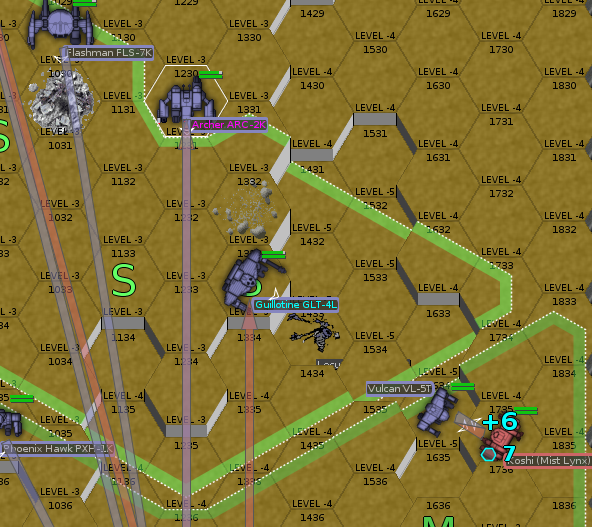 Carcer is in range of a Vedette, and lines up her laser shot eagerly. Woad pushes into the town, thanks to the magic of jump jets, while Blinky lags behind a bit. 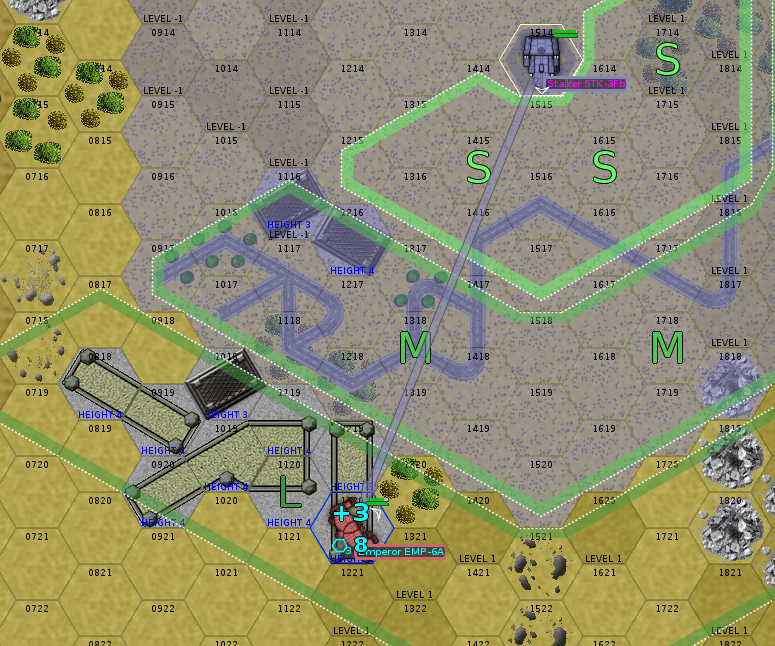 Severe again proves the worth of her Koshi, slicing deep into a Vedette’s rear armor and heavily damaging its engine. Hanzoku finishes off the Vedette darting past his mech with a kick which caves in the roof of its turret. Everyone is in on the action now. 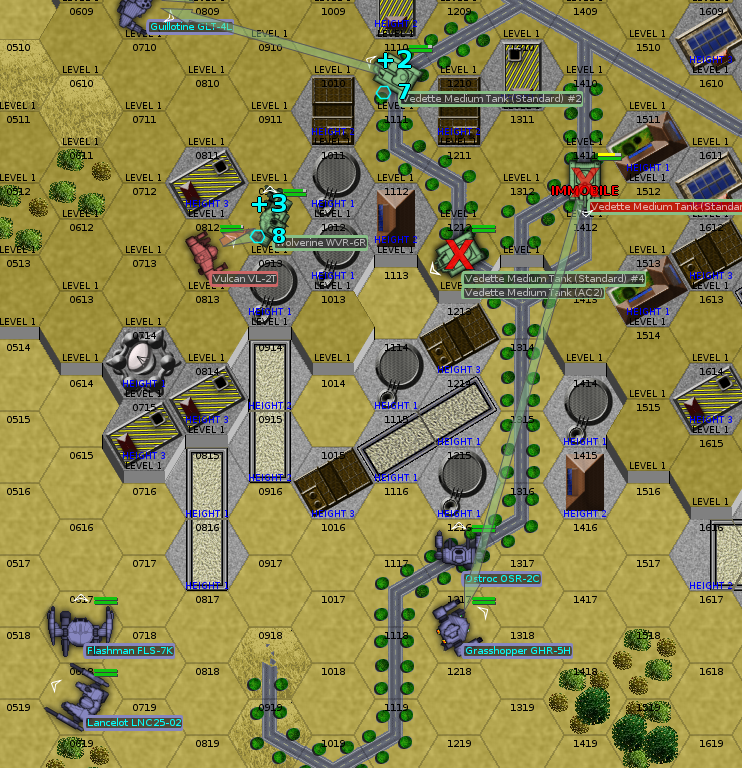 Hanzoku, Carcer, and the allied Vulcan race to take down the enemy Wolverine, while Severe, Woad, and Blinky move into the center of the city to deal with the remaining two Vedettes. Teddy Bear lands a full alpha strike on his target Vedette, immobilizing it and knocking off both tracks, but not quite managing to bring it down with weapons fire. He finishes the job with a kick to the rear armor. Hanzoku beheads the Wolverine with a well-aimed volley of laser fire, notching the kill for himself. Woad and Severe collaborate to immobilize one of the city center Vedettes, while Blinky immobilizes the other. 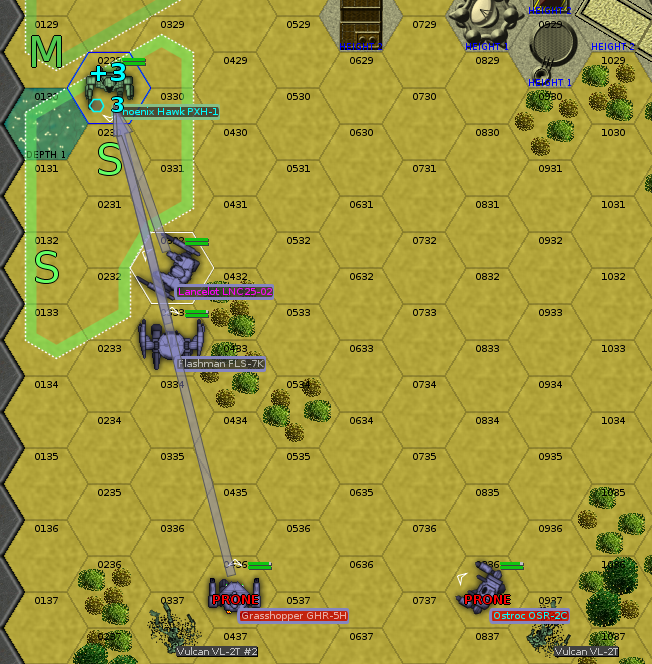 The other enemy mech, a Phoenix Hawk which did very little, falls back, leaving the two Vedettes for Woad and Blinky. Each scores one kill. Our mechs are all but undamaged, none of our pilots are badly hurt, and although we can’t convince the ComStar liaison to give us the Wolverine, we do get six Vedettes for the mechanics to cut apart. An excellent battle, professionally won. 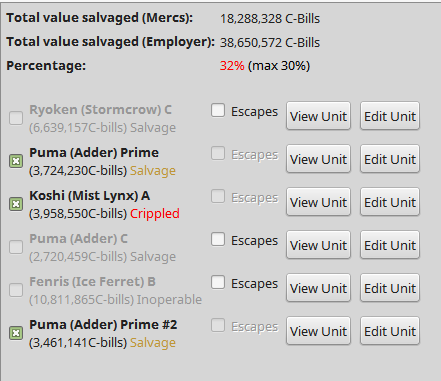 Between selling off the Vedette chassis after stripping them of everything useful and ransoming prisoners, we end the mission up about 750,000 C-bills. Blinky and Hanzoku both emerge with two kills. Hanzoku leapfrogs Linebuster by dint of having more mech kills and now tying for overall count. Forgot to take a screenshot. It’s been a while! I’m out of practice. It is now September 28, 3052; there’s another battle pending. We have 65.431 million C-bills in the bank, up 108,000 since last update. Our techs continue to work on refitting our two assault mechs. Edina Cameron is only a few days’ work away from getting Rook‘s Stalker back into the field. Kepano Endo has about four months of work left on Drake‘s Awesome. Nothing much to speak of. We’re now running MekHQ 0.44. Happily, everything I’d done on a custom basis is now merged into the main branch, so it was pretty painless. Unfortunately, I couldn’t get 0.45 to load the save game, so we may be stuck here for a bit. This entry was posted in All and tagged gaming, letsplay, opinionated bastards on September 15, 2018 by Fishbreath. After the long retreat from the Clans and the hard fighting which occurred along it, things seem positively sleepy in the Opinionated Bastards’ mobile headquarters. In mid-August, though, our somber ComStar liaison stops by, informs us gravely that we have a mission, and leaves as quickly as he came. The rebels are fleeing a ComStar sweep, moving through a seaside town, where we’ll intercept them. Gale-force winds are blowing in from the shore, which forces the rebel vehicles to withdraw before combat. 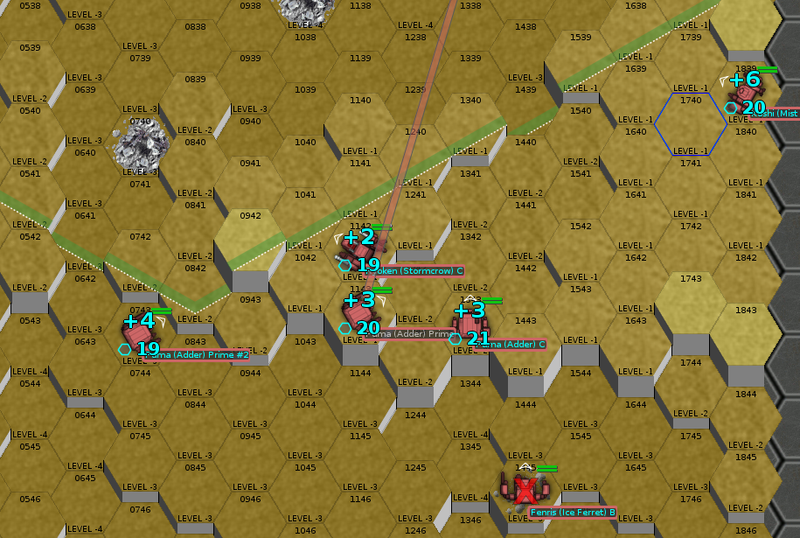 There are four enemy medium mechs on the field: a pair of Vulcans, an Assassin, and a Phoenix Hawk. It’s a successful mission if we knock out two of them. 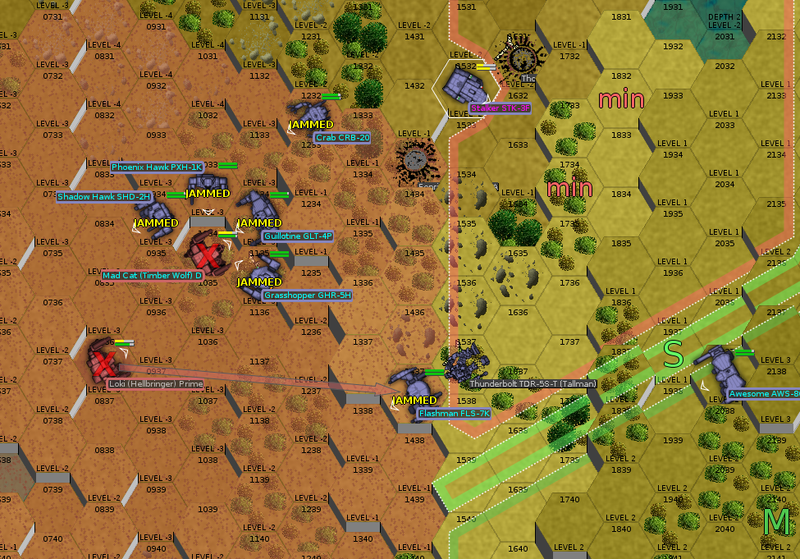 The Bastards deploy near the center of the map. The rebels deploy to the south; they’re fleing to the north. The hurricane winds are going to make it difficult to score many ranged weapon hits, at least while everyone is moving. Linebuster and newcomer Blinky are the only ones with a chance at a hit. The wind is playing havoc with targeting systems; gusts hammer against mech arms, throwing off their aim. Woad and Blinky get into punching range, where they’ll hopefully be able to do some damage without having to rely on ranged weapons. Ranged weapons fire doesn’t accomplish very much. Woad and Blinky exchange kicks with the enemy: everyone hits, but because of the high winds, everyone falls over, too. Rather than attempt to stand, both of the rebel Vulcan pilots eject. They fail to stick the landing. Both end up unconscious. The enemy Assassin manages to take enough fire to lose its footing. Its pilot ejects, too. The Phoenix Hawk is now most likely beyond our reach. He can simply run away. I spoke too soon, though. Bafflingly, he turns to fight. We’ll get one more crack at him. The Ostroc suits Blinky just fine. Even in terrible conditions, he has at least some chance to hit. The Phoenix Hawk pushes a bit further away, but now he’s up against a little river. He probably will need some extra time to get through. I can’t imagine jumping is a very good idea right now. 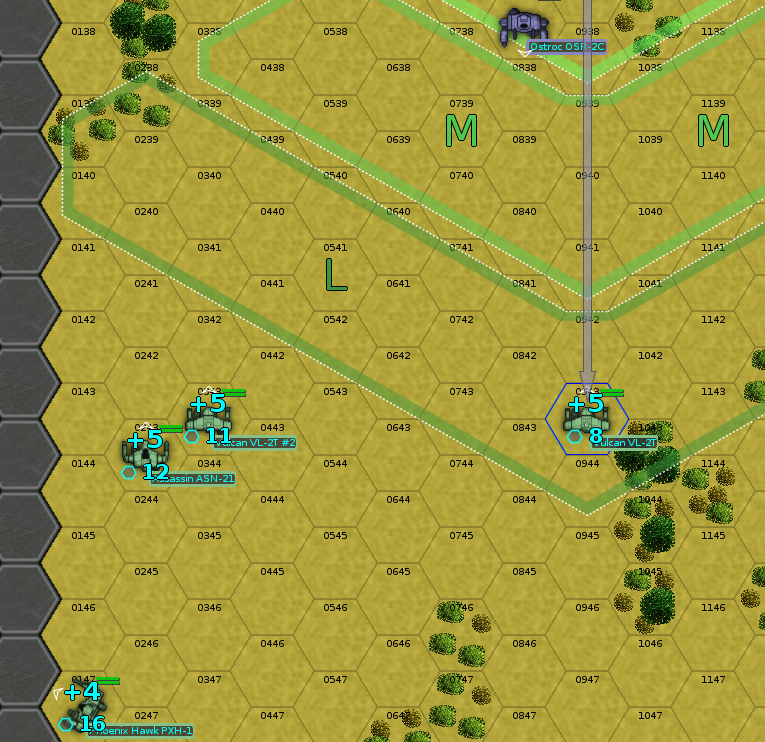 Bear’s Bruisers arrive on the field, with Wojtek in tow (his first combat deployment in a long time). Unfortunately, it proves to be a bit of an anticlimax. The Phoenix Hawk steps into the water, trips, and falls, and the pilot immediately ejects. Woad and Blinky both have minor injuries from falling over, and their mechs have light damage. 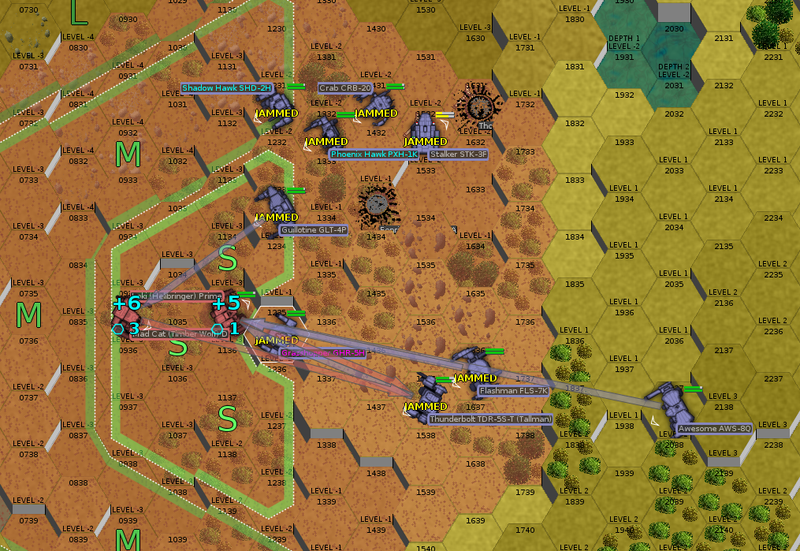 After the storm passes, we recover the enemy Phoenix Hawk and the enemy Vulcan, both of which are in serviceable shape. We’ll probably strip the Vulcan (a VL-2T model) and keep the Phoenix Hawk, at least for now. The latter chassis is handy to have; a good weight to fill in around the edges of a heavy lance. One of the rebels, after ejecting, managed to shelter in the wind shadow of one of our fallen mechs. ComStar takes her off our hands as soon as the weather permits. I’ll say this: we didn’t exactly cover ourselves in glory this time. 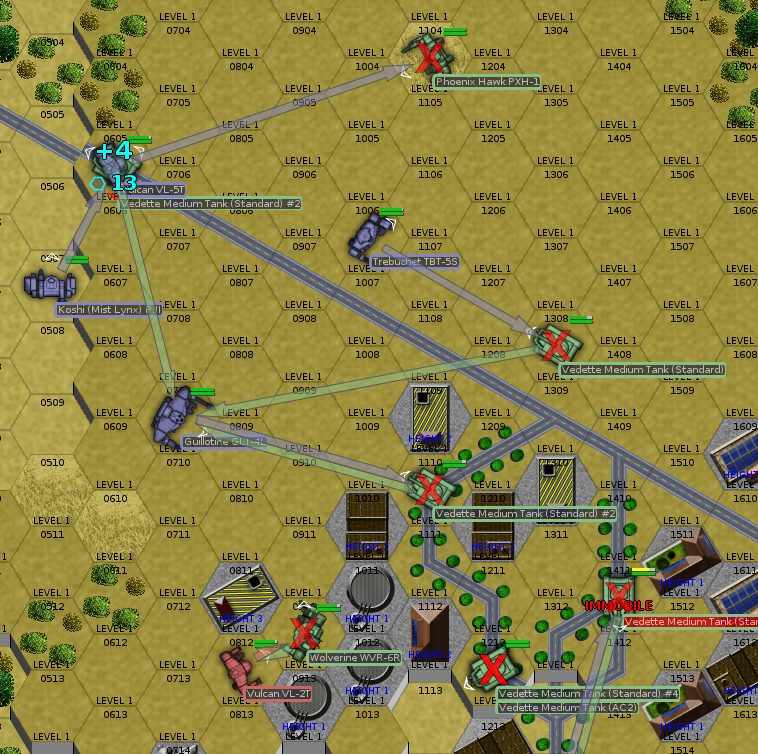 Although four enemy mechs were destroyed on the last mission, we scored precisely zero kills. It is now August 31, 3052. Rebel morale remains high. Given the much less threatening opposition, I’m trying to rotate in some of the under-utilized pilots. Wojtek was on the board this time; hopefully we can get Euchre in next time. We have 65.323 million C-bills in the bank. 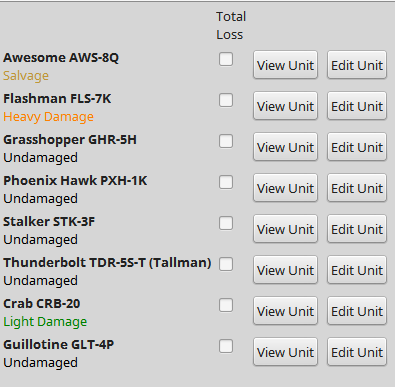 The following mechs are available on the unit market. 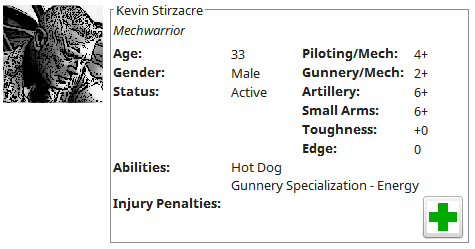 All of our pilots currently have mechs, however. Both of the techs who are working on the refits flubbed their finish-on-time rolls. As of now, it’s another five months for the Awesome and another month for the Stalker. This entry was posted in All and tagged gaming, letsplay, opinionated bastards on July 3, 2018 by Fishbreath. The ComStar liaison is an odd, somber fellow, who assigned us a sector to patrol, wished us well, and sent us on our way. June passes without much action. 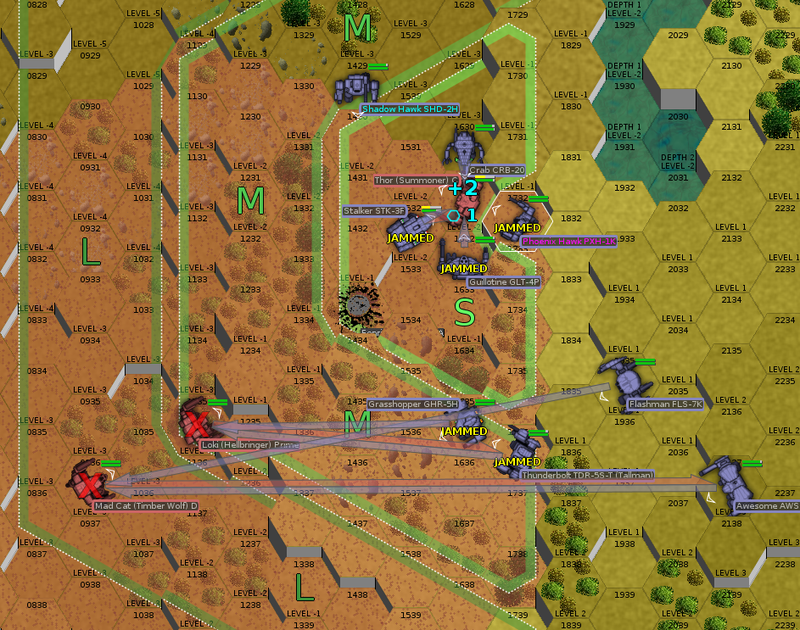 We’re called out of our forward positions a few times, but when we arrive, the the rebels have already fallen back. On June 30th, however, an intriguing message arrives at headquarters. A rebel commander challenges us to a duel. The Clanners in our employ enthusiastically favor the idea. Drake is a little more cautious. He eventually decides to accept, if only to bring the rebels to action and get a kill on the board. Who should be our champion? Rook, our deadliest pilot by far, seems like the obvious answer. With her Stalker in the shop, she borrows the Flashman from Carcer and heads out. Wizard and Hanzoku accompany her, playing bodyguard in the event the rebels try to get cute. Waiting for us at the designated place of battle is… a Banshee. The Banshee, a 95-ton assault design dating to the dawn of the Star League era, is widely mocked as ineffective. Its armament totals a PPC, an AC/5, and a small laser, a piddling armament for a mech of that size. Most of the tonnage goes to an enormous GM 380 engine, which makes the Banshee about as fast as the Flashman facing off against it. In other words, not very fast. Closing in. 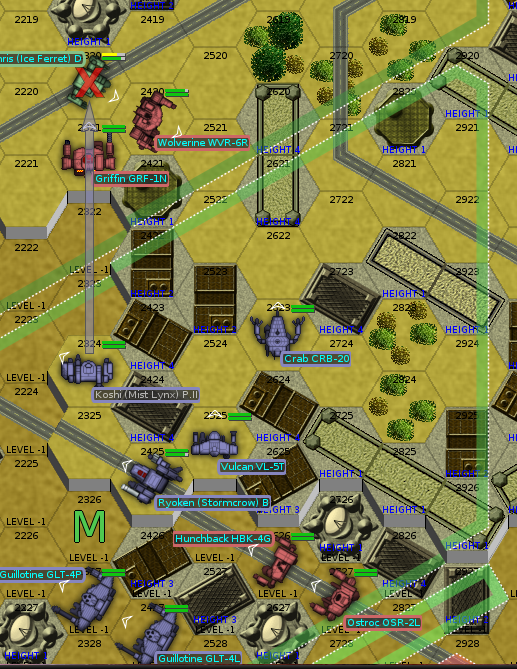 Rook, still outside of medium laser range, lands hits with both of her large lasers, but takes a PPC hit in response. The Banshee closes in. 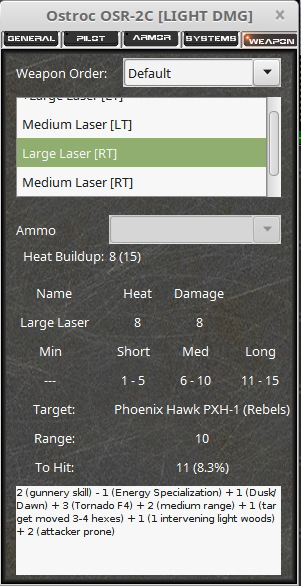 Rook slows down, hitting again with a large laser and taking a hit from a PPC again. 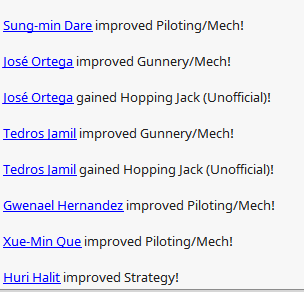 Again, the mechs trade fire. Sensing that the Banshee is trying to get around behind her, Rook backs up and lands more lasers on it. She takes another hit to the center torso, and is nearly out of armor there; the Banshee’s been good at keeping its hits in the same place. Though Rook is hammering the Banshee, it gets into a semi-flanking position; she can only return fire with one large laser. 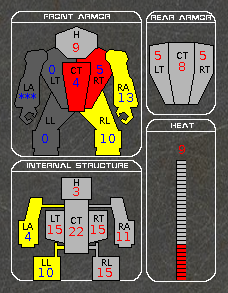 In return, she takes still another PPC to the center torso; it eats through the armor and damages her engine. The alarms don’t faze her. Obviously, Rook scores a kill. It is now July 3, 3052. Despite Rook’s victory over the rebel leader, reports indicate that rebel morale is high. We have 60.801 million C-bills in the bank. A new face shows up at our camp, another Rasalhague citizen shows up looking to sign on. 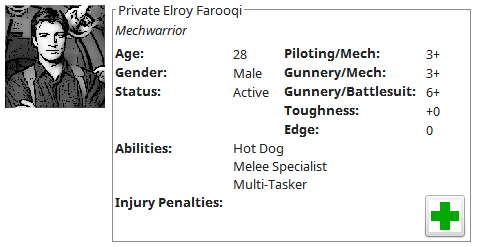 Newly-minted Private Elroy Farooqi was in the service of the Republic some time ago, but quit for reasons he refused to say, and spent some time as an independent operator in the coreward periphery. During the long retreat from the Clan invasions, he organized local militias and ad-hoc defenses; now, there’s no call for that, but he wants a piece of the fighting again. Both assault mechs are in the shop, refitting. The Awesome is 55 days from completion. The Stalker is 32 days from completion. Otherwise, we’re in good shape. This entry was posted in All and tagged gaming, letsplay, opinionated bastards on May 26, 2018 by Fishbreath. The Opinionated Bastards spend the month of May engaged in the typical activities of warriors removed from the fighting. Some work on maintenance. Others hit the simulators. Still more poke around the small city where the Bastards are ostensibly guarding evacuees from the combat zone, looking for leisure and finding little of it. Drake spends some time with MechTech Endo, learning the ins and outs of his Awesome’s guts. Between the new double heat sinks, the new power conduits and mounting points for the Clan PPCs, and the general rebuild-it-from-scratch thing, it’s a serious project, and is going to be a serious project for some time longer. News reaches the Bastards both by radio intercepts and by our Free Rasalhague Republic liaison, who is a little more plugged into happenings than we are. The general impression is that things are going well. As mid-May passes, the news turns a bit more sour, but Hanzoku points out that Clan Wolf’s victories are largely symbolic. The Com Guards have already won the balance of the fighting, and that’s enough. On the 20th, the fighting stops. The distant rumble of heavy weapons fire falls silent. News filters out: the Truce of Tukayyid is now in force. The Clans may not advance past Tukayyid for fifteen years. With that, our purpose in the remains of the Free Rasalhague Republic is moot. Our liaison informs us that he’ll be paying us the rest of our fee, and that we’re free to stay for a while, but there’s no more combat against the Clans to be had in his government’s employ. The Bastards stick around through the end of May, at least. Few of the planet’s residents join them; most of the large population centers were ruined during the fighting, and despite its newfound historical importance, Tukayyid is still a backwater. Our mechs keep an eye on the loading process, as DropShips arrive to carry off the portion of the population which doesn’t want to stay. Nothing much going on this month. It is now June 1, 3052, and a very different world awaits. The Bastards are not currently under contract. We have 47.259 million C-bills in the bank. The Awesome is still three months away from combat readiness. Otherwise, we’re in top fighting shape. An Ostroc is on the way for Blinky. The whole of the Inner Sphere is our oyster, as the saying goes. In the short term, we’re in excellent shape. Our war chest is large enough to absorb a long wait while we refit most of our mechs to be more Clan-competitive. 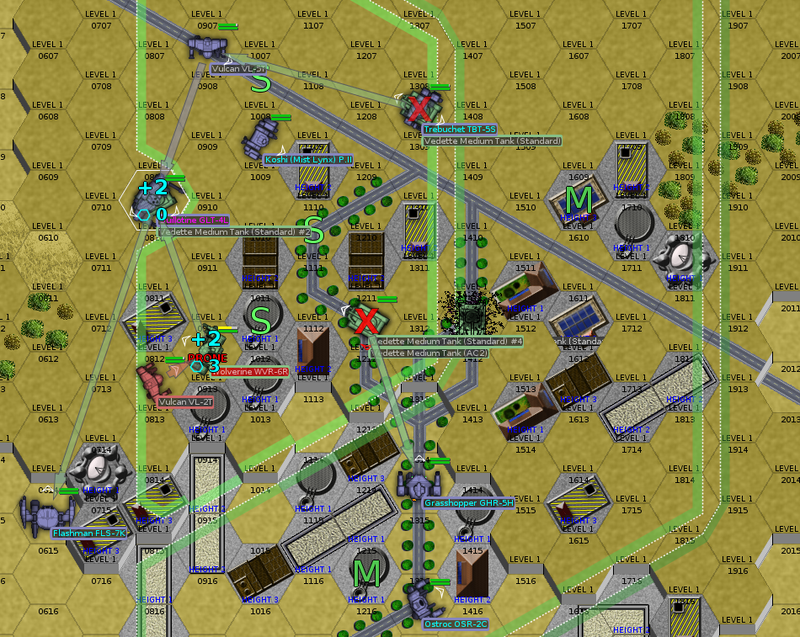 Alternately, we could take an easy contract while we’re refitting, taking it a bit more slowly and getting our greener pilots some experience against an easy opponent. As it happens, there’s just such a contract available: ComStar offers us a job fighting rebels right here on Tukayyid. Since some of Tukayyid’s residents aren’t happy about the devastation or the ComStar takeover and the Com Guards are seriously battered after the battle against the Clans, our services command a premium. ComStar would be paying us better than the Free Rasalhague Republic did. On that note, what do we want to refit? 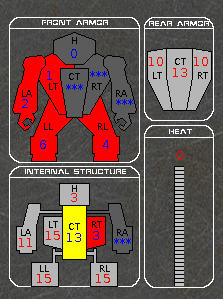 I think it’s probably a good time to get the Stalker done, at a minimum, but most of our heavy mechs would benefit from a double heat sink refit. We’re a pretty energy-heavy company at present. This entry was posted in All and tagged gaming, letsplay, opinionated bastards on May 19, 2018 by Fishbreath. Readers familiar with the BattleTech lore will have put May 1, 3052 and Tukayyid together already. For everyone else, the Battle of Tukayyid is one of the seminal events in the history of the Inner Sphere. ComStar, up until now believed to be merely the people who run the hyperpulse generator interstellar communications network, reveal themselves to be guardians of enormous caches of Star League technology and an army as large as any of the Great Houses of the Inner Sphere. They challenge the Clans to a Trial of Possession, a throwdown for the fate of the known galaxy. Seven miniature battles are set for Tukayyid, seven Clans against seven units of the Com Guards. If ComStar wins, the Clans advance no further than Tukayyid for the next fifteen years. 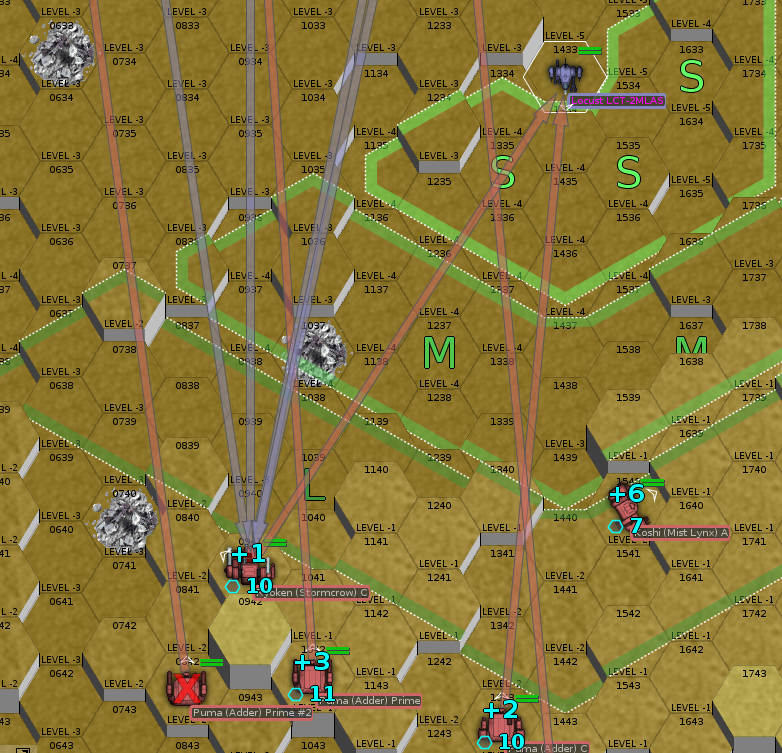 If the Clans win, ComStar forfeits Terra itself. I won’t spoil the ending. 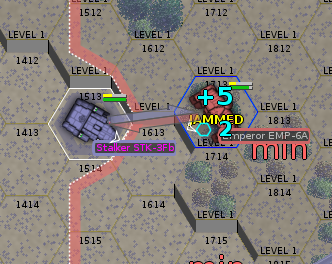 What I will do, since the Opinionated Bastards are on the sidelines for this month, is replicate one of the official Battle of Tukayyid scenarios and play that, with the Bastards replacing the Com Guards for fun. The scenario is #3 from the BattleTech Tukayyid sourcebook: Battle in the Suburbs. 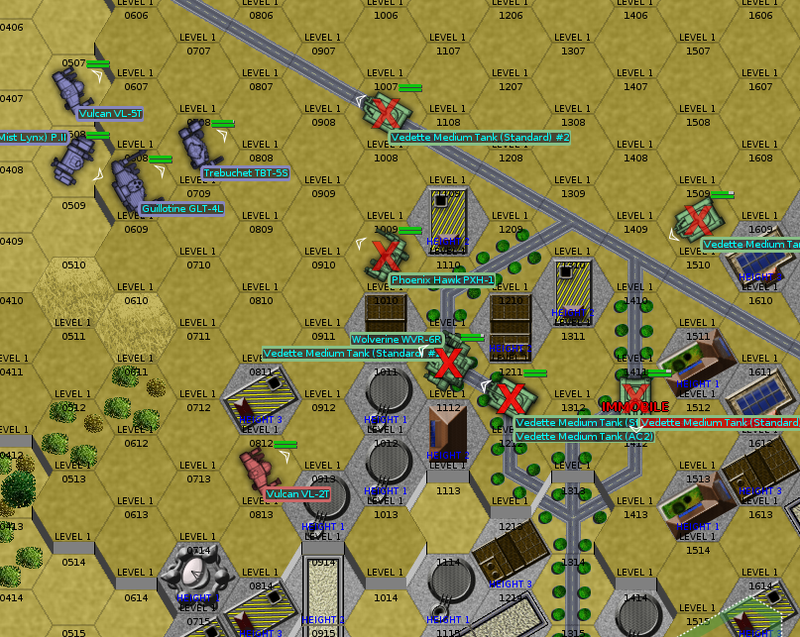 Clan Nova Cat’s forces, battered somewhat by ComStar aerospace fighters while landing, nevertheless marched on the city of Joje in moderate force. 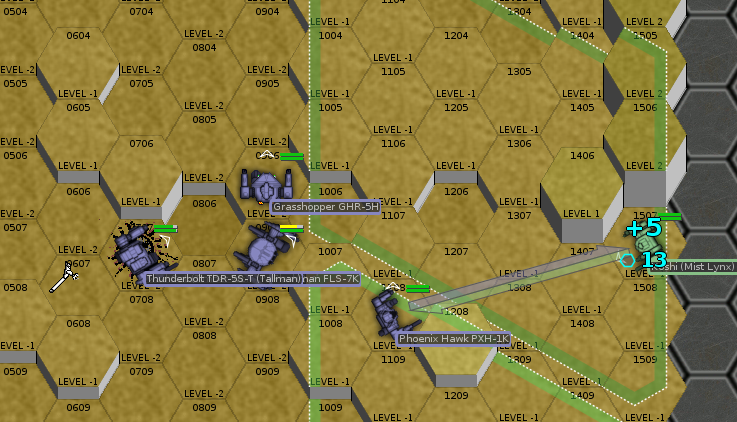 In the real timeline, two veteran Com Guard divisions stood ready to meet them. 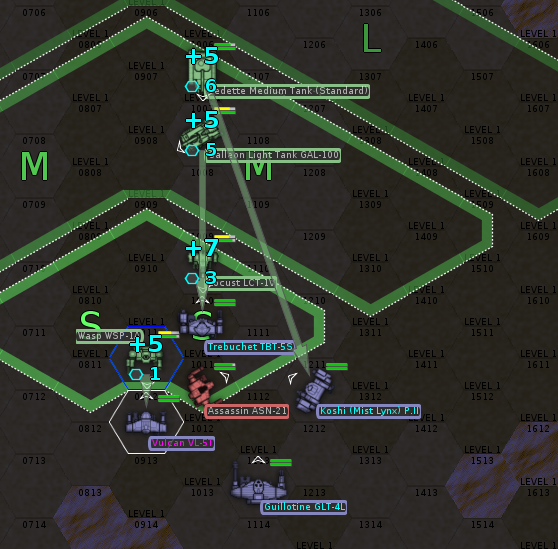 The Nova Cat commander who won the batchall for the attack bid a single Cluster, which matched the Com Guard strength mech for mech, but ignored the Com Guards’ penchant for combined arms tactics. An engagement in the northern suburbs between the 9th Division and the leading elements of the Second Nova Cat Guards saw the Clanners stopped in their tracks. 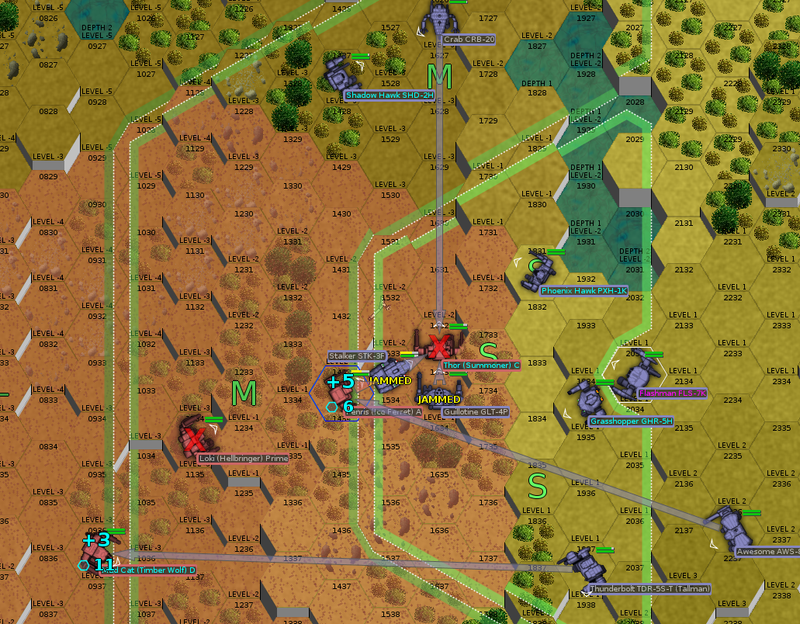 The Nova Cat forces, heavily dependent on ammunition supplies, made no further progress into Joje. In our hypothetical timeline, it isn’t the Com Guards who meet the Nova Cat forces in Joje, it’s the Opinionated Bastards. In particular, it’s Drake’s Destroyers, Second Lance, and Reserve Lance. Facing off against them are two stars of Clan mechs, one medium, one light. The light star is down one mech, for a total of 9 Clanners. All are elite pilots. This entry was posted in All and tagged gaming, letsplay, opinionated bastards on May 13, 2018 by Fishbreath. Five months. Well, when it’s ready, it’ll be a sight to behold. 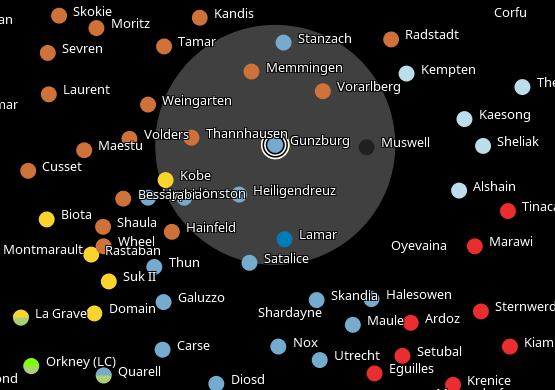 There are rumblings amongst the Rasalhague garrison that something big is going to happen soon: a truce, an Inner Sphere counterattack, something. That’s a long way off, though, and we have more immediate concerns. 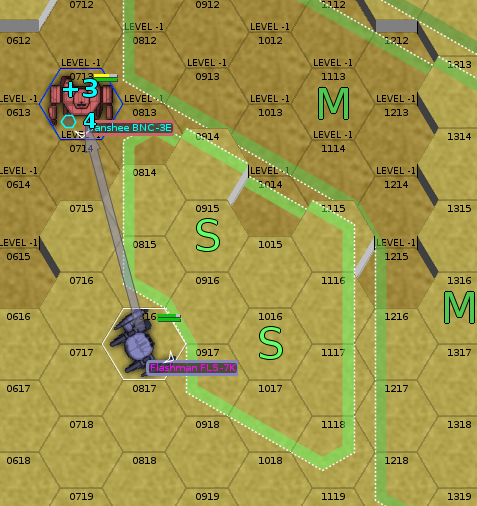 A Rasalhague officer appears in the Bastards’ command post—a little more makeshift and a little more tumbledown than in the past; moving world to world at this pace is hard—and lets us know that a full Star of Clan mechs has been spotted marching toward the city of Spanac. 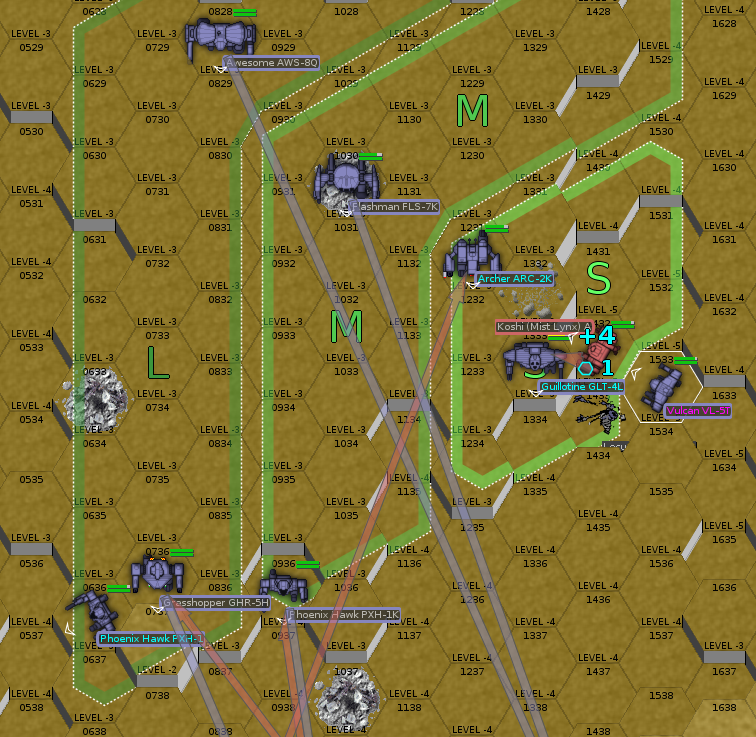 There’s a Rasalhague force moving to intercept, but they’ll need reinforcements. Second Lance and Bear’s Bruisers drew patrol duty today. Drake redirects them there. It’ll be a race against time. Since it’s been a while since these two lances deployed, here are their dispositions. The Ryoken still has a damaged arm, but will have to get by. The Ultra AC/20 is its main punch anyway. The Opinionated Bastards are arriving a little late to the party. We’ll deploy as we arrive. To get full credit for the mission, we’ll have to keep at least some of the extant Rasalhague forces alive. None of our forces arrive until before Round 4. 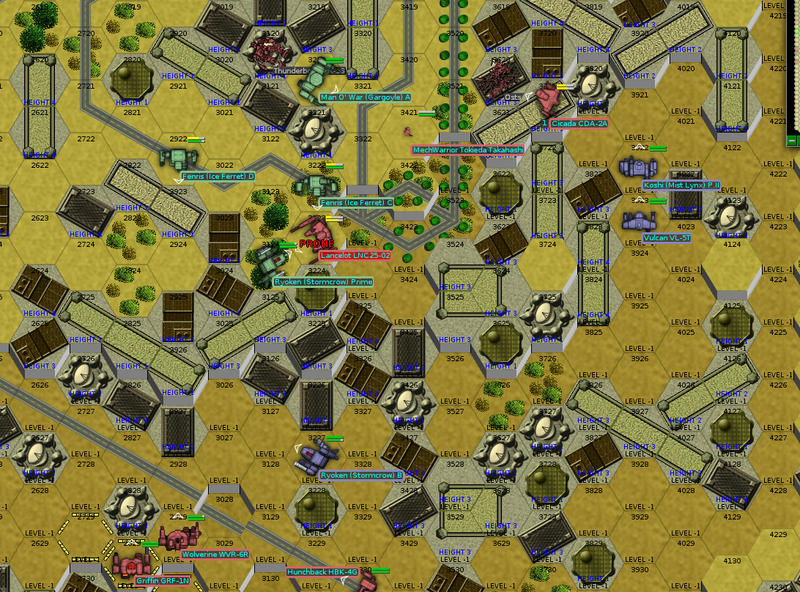 The Rasalhague forces deploy around the city in the middle of the map, while the Clanners appear all along the northern border. 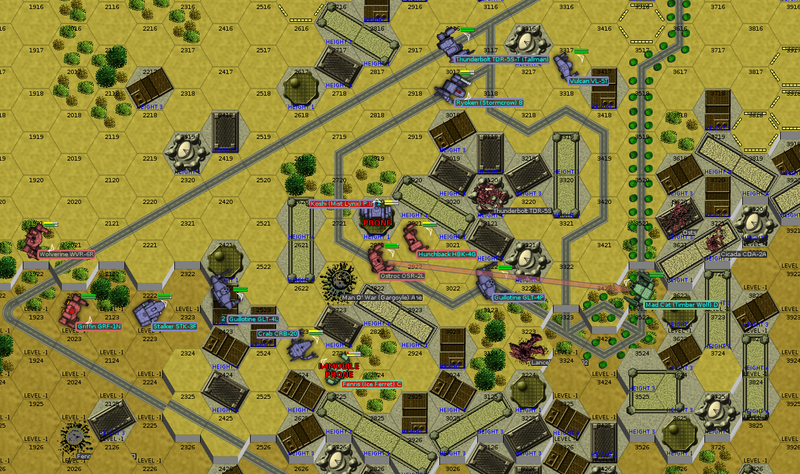 They advance, exchanging LRM and PPC fire to no effect. 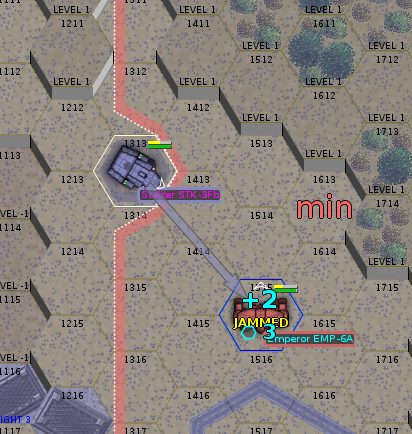 The Rasalhague forces remain entrenched in the city, while the Clanners close from all angles. 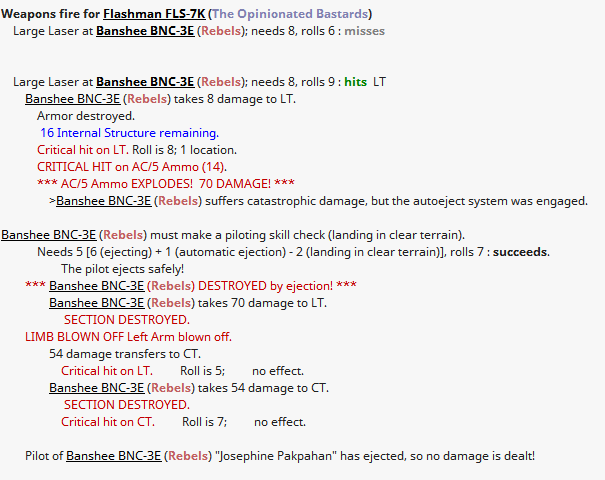 The lightest Rasalhague mech, an Ostscout, takes heavy damage and loses a leg. The Clan mechs, rushing into combat and toward glory, slip on the pavement. A Fenris trips, sliding into an approaching Ryoken and nearly tripping. 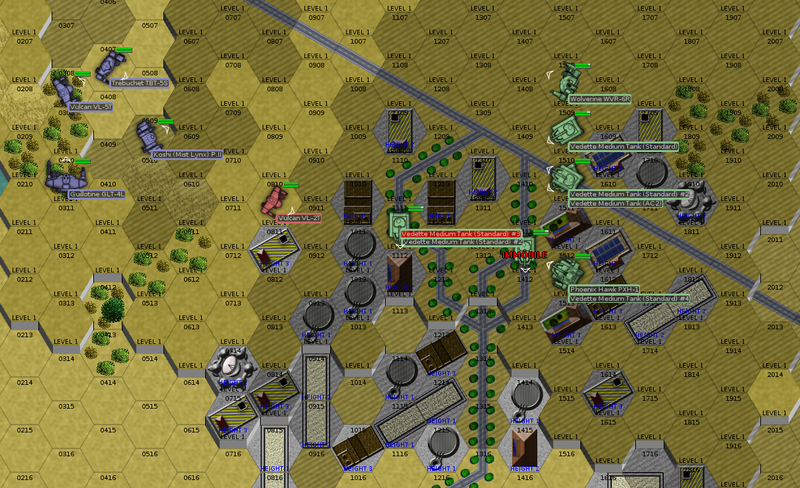 The Rasalhague mechs, whose pilots are largely green, fail to take advantage. The Clanners, however, remain focused on the ailing Ostscout. Severe is the first to arrive on the scene. 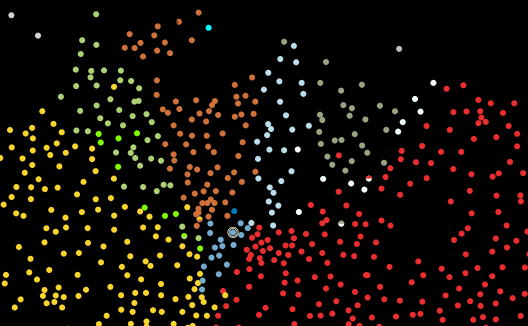 (The minimap shot up under round 1 has her position highlighted.) Her sensors paint a confused picture. Firing continues in the city. Severe is going to move closer, but attempt to stay out of the way until reinforcements arrive. 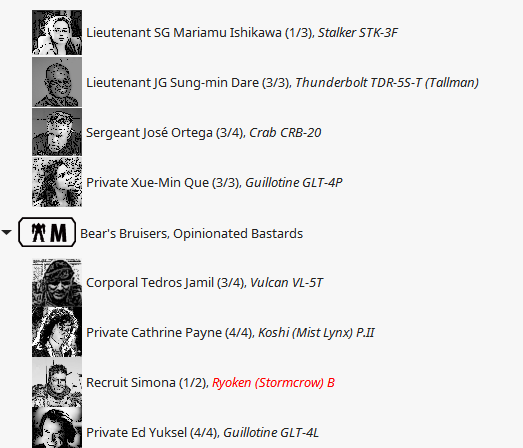 Teddy Bear‘s Vulcan arrives before Round 5, and Simona in the Ryoken appears before Round 6. The Rasalhague Ostscout finally falls. 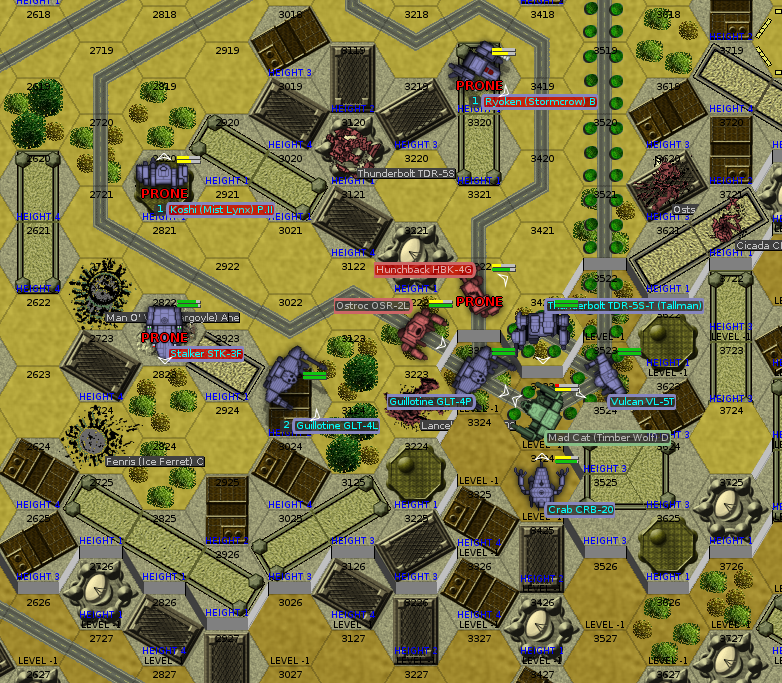 A full company of mechs now battles in the city, although two of the Rasalhague mechs are hanging back. Teddy Bear arrives, and he and Severe link up on the road south of the city. 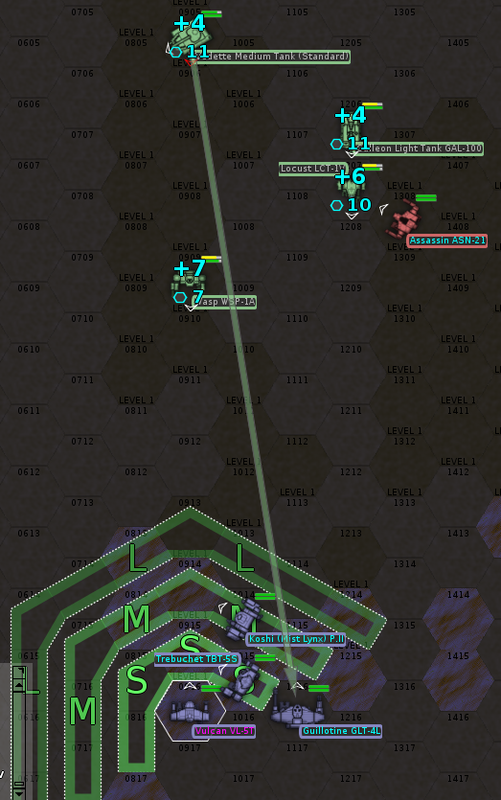 The heaviest Rasalhague mech, a Thunderbolt, falls. Chatter on the Rasalhague radio net turns panicky; that must have been their commander. Teddy Bear quickly switches his radio over to the right channel, and calls for the Rasalhague forces to retreat and regroup south of the city, falling back on the Bastards. 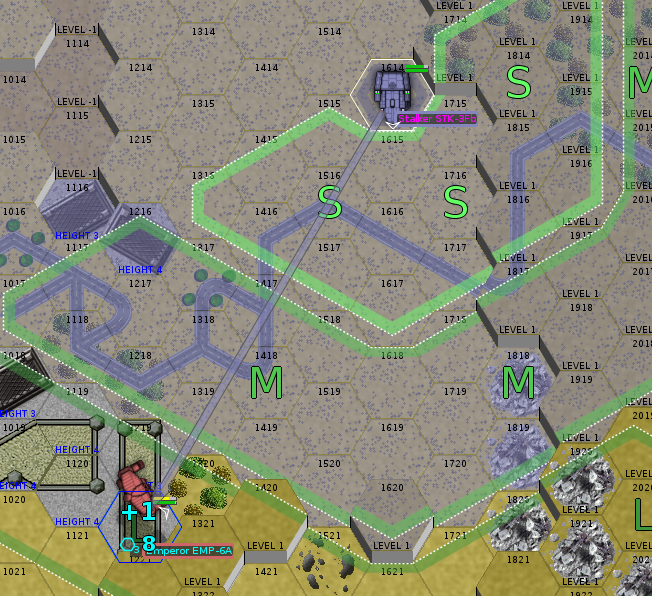 The six remaining Rasalhague mechs are a little slow to respond, and a little out of position to boot. Happily, most of them have jump jets, and the command to turn and run seems to be a pretty welcome one. Milspec in the Crab, plus the ever-dependable Wizard and Hanzoku in their Guillotines, arrive soon. 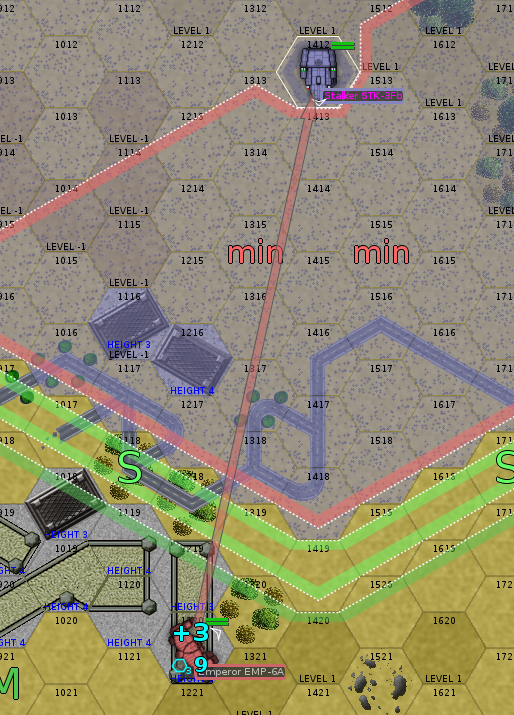 With the Rasalhague forces rallying to us, we may be able to turn this around on the Clanners. 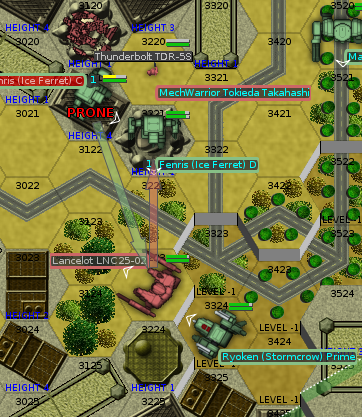 The allied Lancelot appears to be trapped; unable to jump and deployed on the wrong side of the buildings, it’s facing down the enemy Ryoken and Man o’ War. We’ll see if we can extricate it. We can’t support it with weapons fire yet. Its pilot aims, not for the Fenris shooting at it, but at the building underneath it. The gambit doesn’t work; the building survives. The Lancelot is likely to take a serious beating. South of the city, the Bastards and the Rasalhague forces are consolidating. Soon they’ll be in position to make a push. 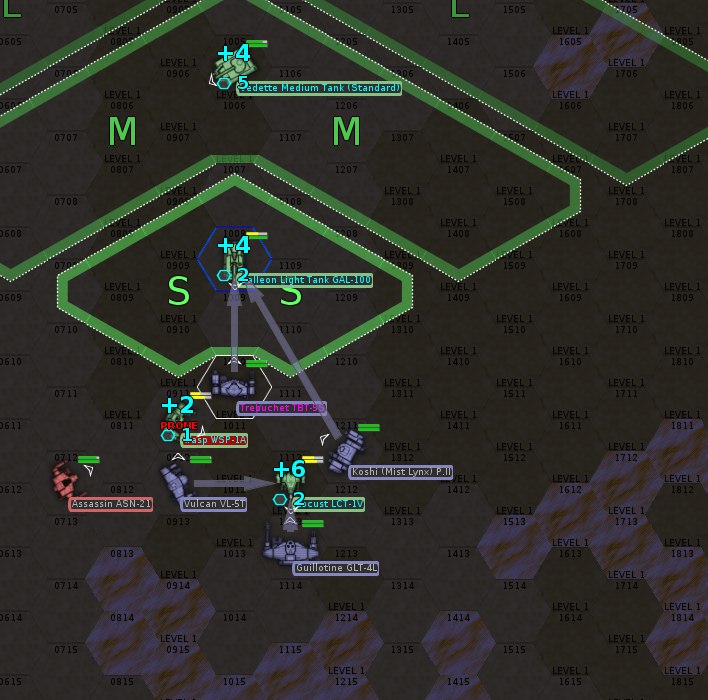 The allied Ostroc actually has a shot on one of the enemy Fenrises, and takes it gleefully. So does the Cicada. Severe joins in, firing the Bastards’ first shots in anger from a Clan mech. Double Dog hits the field. Only Rook remains to join the fray. We don’t have a lot of LRMs, but we also don’t want to charge around the corner until we can bring more mechs to bear at once. The allied Cicada, perched atop a building but out of sight of most of the enemy mechs, will do some spotting, as will the Lancelot, which is probably doomed this turn. The allied Lancelot does indeed eat it, and the Cicada takes a hit from one of the Fenrises which knocks out one of its legs. Fully half of the allied mechs have been either destroyed or rendered combat-ineffective. 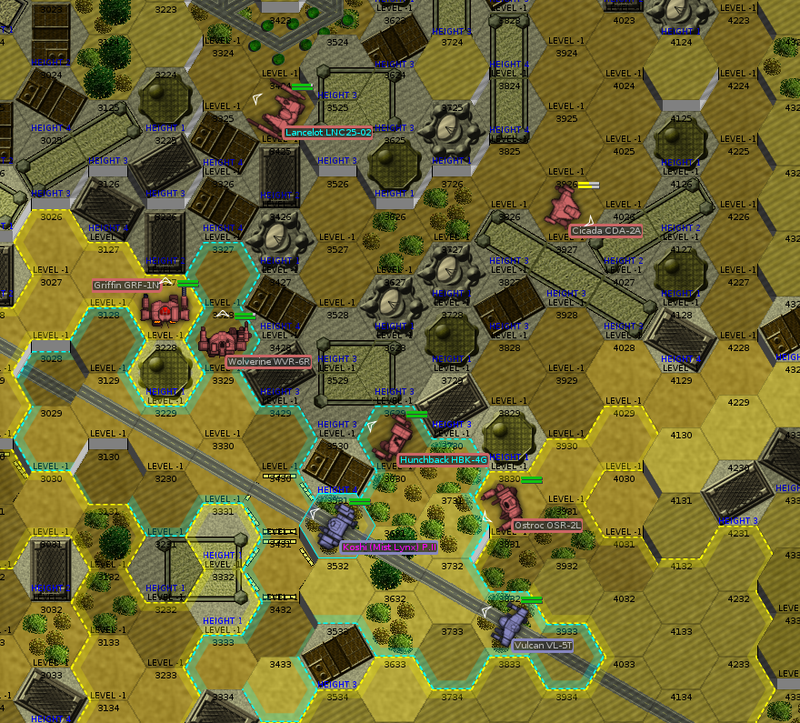 Happily, we’re now in a position to begin our own attack, swinging around to the left to engage the Clanners. Simona finds himself a good position with the Ryoken, switching his Ultra AC/20 over to burst mode and targeting the rear of the enemy Ryoken. Rook, too, takes her first shot of the day, a low-percentage LRM-10 salvo against the enemy Ryoken. The allied commander, who survived the destruction of his Thunderbolt and managed to eject, is directing fire. For his trouble, he immediately takes a hit from the Man o’ War’s large pulse laser. Simona hits with one of his two AC/20 shells, shearing off the enemy Ryoken’s right arm and cutting deep into its right torso armor: a successful sneak attack. He’ll get down from the building now, to avoid taking any return fire. The allied Cicada is still clinging to life, but not for very long. Rook, who took command when she took the field, encourages its pilot to eject. The Rasalhague pilot does so. At present, our forces are still jockeying for position. The next round sees the Bastards moving into attack range of the enemy. 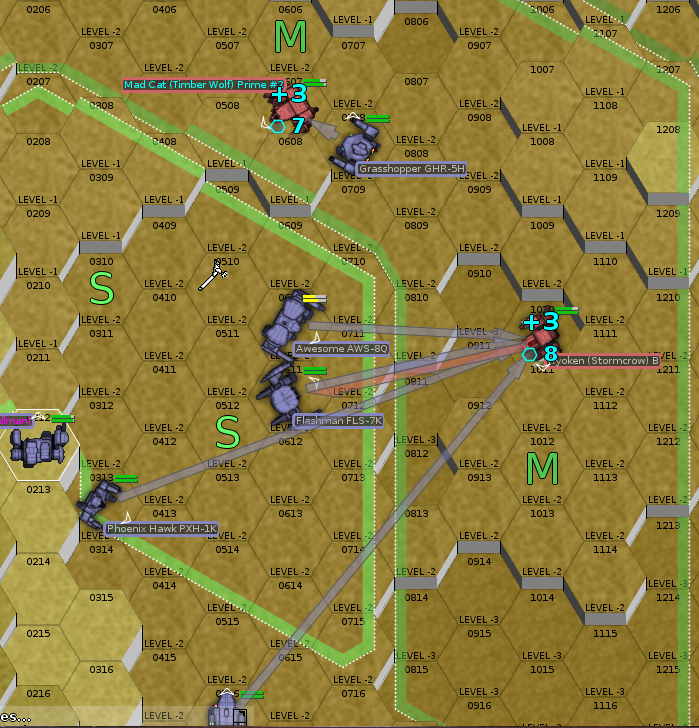 Severe takes a shot at a Fenris caught a bit out of position, joined by Wizard and the Rasalhague medium mech drivers. Simona is itching to bring his AC/20 to bear, but is just out of range behind a building. The Fenris unloads at point-blank range with four medium pulse lasers, knocking the Rasalhague Wolverine over and readying a kick. Severe misses with everything, though Wizard scores with her PPC. The Rasalhague Griffin readies a kick itself. Though the Wolverine absorbs a kick, the Griffin’s kick knocks the Fenris down. A pillar of dust around to the west comes as a surprise to the Bastards on the field. Sensor records later indicate that it was an enemy Fenris, attempting to flank, which skidded into a building. The Rasalhague Wolverine loses an arm to fire from the Fenris, but beyond that, not much happens. Severe is on the hunt for the enemy Fenris to the north, while Simona and Milspec aim to put some fire on the enemy Ryoken. Simona, unfortunately, is under fire from the enemy Man o’ War, too. Hopefully he’ll weather it well. It seems he does: he takes a few hits, and fire from the Ryoken facing him eats into his left leg and strikes the myomers in the shin. Otherwise, his armor holds, and with a devastating AC/20 shot to the chest, he knocks the enemy Ryoken out. We’ll have to see about salvaging it later. The Clan Wolf Man o’ War moves up, and the battle is well and truly joined. Teddy Bear, Severe, Hanzoku, and Milspec have clear shots at it, while Simona has managed to move just out of its path. He exchanges fire with the flanking Fenris, now back on its feet, instead. Double Dog shoots at the back of the Fenris from up north, hoping to bring it down in concert with the friendly Wolverine. As might have been expected, Simona loses the Ryoken’s right arm and its attendant medium lasers. Hopefully we can salvage those. The Man o’ War takes a good bit of damage, but Milspec‘s cockpit flashes with alarms: his right torso armor is gone. 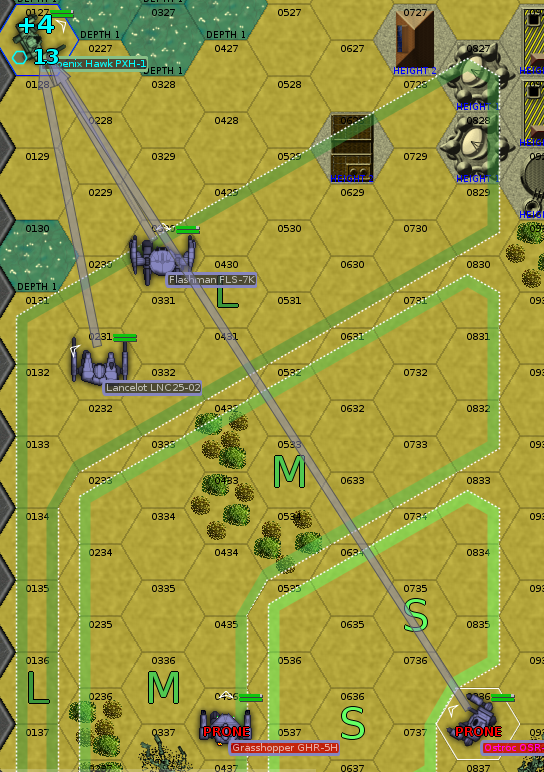 The Man o’ War lays heavy fire on the Koshi, which I stupidly put a little too close to its arc of fire. Severe does what she can to stay on her feet, but bolts shear apart and her mech’s left leg detaches at the hip. Hanzoku, however, scores a kill on the Fenris hassling Rook, while Simona blows a leg off of the other one. 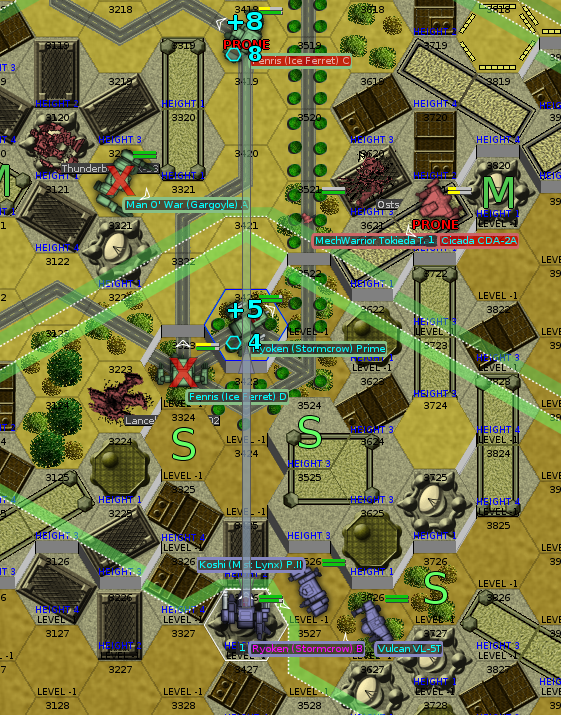 Simona is out of danger now, and Rook is in LRM and large laser range of the Mad Cat perched on a building over to the east. The enemy Man o’ War, though still evidently in good shape, has nearly been cored; its center torso is all but gone. Wizard scores the kill on the Man o’ War, shooting through its tattered rear armor, and knocking out its engine. Milspec is left to deal with the downed Fenris, while the rest of our little force advances on the Mad Cat, the only enemy still in fighting shape. Its pilot jumps down from the building, taking it out of the arc of fire of most of our mechs. Trading fire with the Ostroc, the Mad Cat neither deals nor takes serious damage. Milspec gets the kill, kicking through the Fenris’ chest. For once, initiative goes our way. The Mad Cat moves first, and we’re able to bring a lot more firepower to bear; six or seven mechs take shots at the Mad Cat. Not many hit, however; we’re shooting from a bad position. Hanzoku and Wizard are going to try to get closer; their mechs are well-armored and have legs fit for kicking. Simona takes a few hits, and his poorly-repaired Ryoken doesn’t behave quite like he expects. It tips over and falls, and as he recovers his senses, he realizes his left leg is out of action. It looks like the end for the Mad Cat, and indeed it turns out to be. 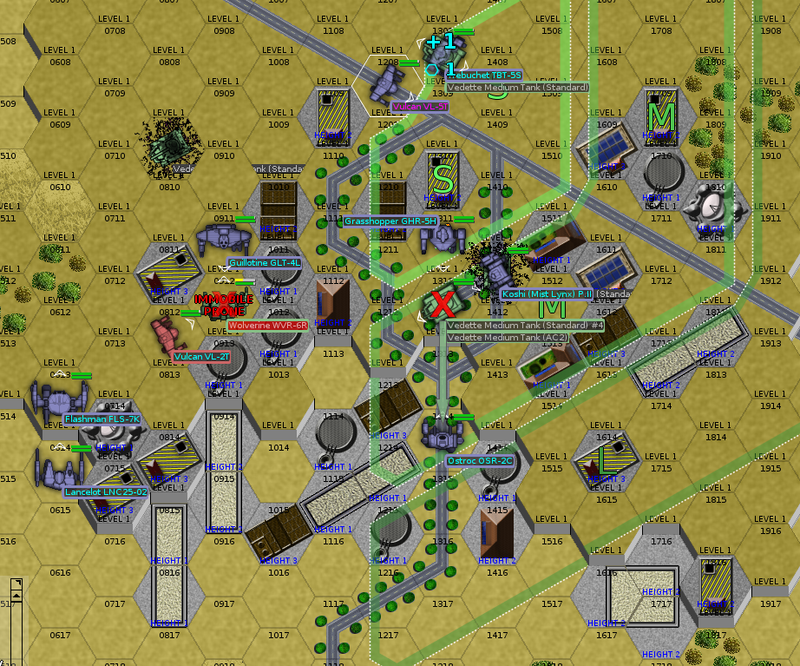 Wizard‘s barrage of medium laser fire chews through its engine and brings it down. 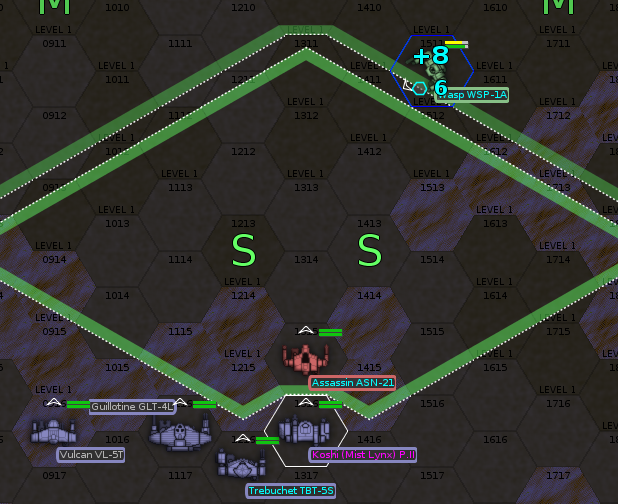 In the Crab, Milspec took heavy damage, while both Simona in the Ryoken and Severe in the Koshi lost legs. Despite that, injuries are light, and salvage is good. We take the Mad Cat and the Ryoken. Both end up yielding good salvage. Unfortunately, we don’t manage to pull any intact ER PPCs out of the Mad Cat, but we do secure a Clan 375 XL engine, which we could probably trade for an Inner Sphere assault mech without too much difficulty. The Ryoken ends up being an even better haul than expected. Its engine survived, too, and now we have a spare for Simona’s Ryoken. We also take an ER Large Laser from the wreckage. Otherwise, the Mad Cat yields a brace of Streak SRM-6 launchers plus some ammo. We also strip a good deal of Clan Ferro-Fibrous armor off of the two mechs, which is important for our long-term capability to field the Koshi and the Ryoken. Wizard continues her charge up the leaderboard with another two kills this month. She’s tied for second in mech kills, and has a dominating lead when it comes to bringing down Clanners. As the Bastards scramble, as usual, to repair and refit before the next fight, something strange happens. 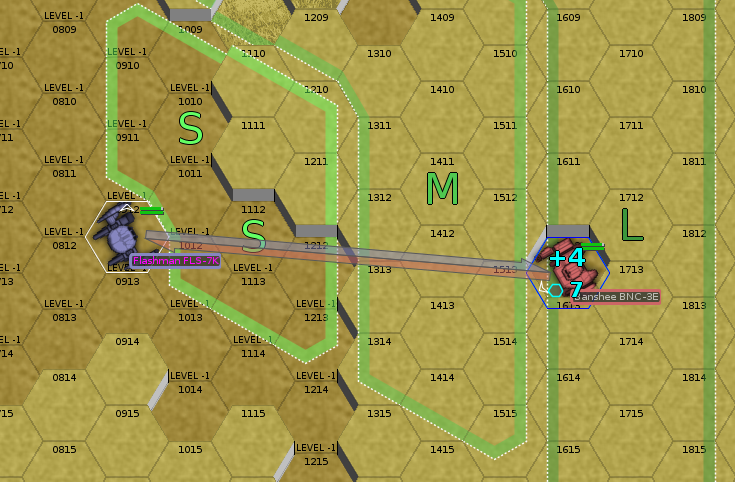 On April 15th, the Clan Wolf forces raiding Tukayyid pull back to orbit. Soon after, our little backwater is suddenly the center of a tremendous amount of activity. Ships from six other Clans appear in orbit, along with a vast fleet of vessels with the ComStar insignia. Our Rasalhague liaison bandies about terms like ‘batchall’ and ‘Trial of Possession’, which Hanzoku explains, and other terms like ‘the fate of Terra’ and ‘utter ruin if they lose’, which the rest of the Bastards understand just fine. 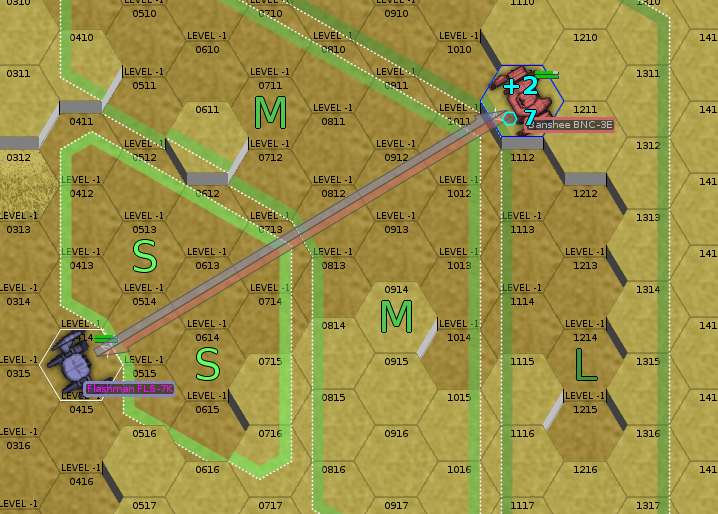 ComStar has taken over all defense arrangements against the Clans, and shunted the Rasalhague Republican forces off to provide security for civilians evacuated from the combat zones to come. We’re more than happy to babysit refugee convoys and sit out of the action for a bit. After all, we still get paid. It is now May 1, 3052. Our contract has been extended, but there’s a reasonable possibility it might be cut short early, unless ComStar loses. We have 42.046 million C-bills on hand. With the obvious exception of the Awesome, which is still four months away from completion, the Bastards are at full strength. With the Clan heat sinks we salvaged from the Mad Cat and downed Ryoken, we were able to bring Simona’s Ryoken back to a full complement, and we even have five to spare. As far as negatives go, several of the ER Medium Lasers in our Ryoken’s arm were total losses. At present, it has four instead of the design six, and we have no spares. Teddy Bear acquitted himself well in combat, rapidly taking stock of the state of things when he arrived on the field. By taking command of the Rasalhague mechs, he managed to keep a full lance of them alive in the face of overwhelming Clan firepower. As such, he’s been promoted to Sergeant. Not much to do right now, except sit back and watch the fireworks. This entry was posted in All and tagged gaming, letsplay, opinionated bastards on May 6, 2018 by Fishbreath. The Opinionated Bastards pack up and ship out, leaving Piedmont for the Free Rasalhague Republic world of Stanzach. 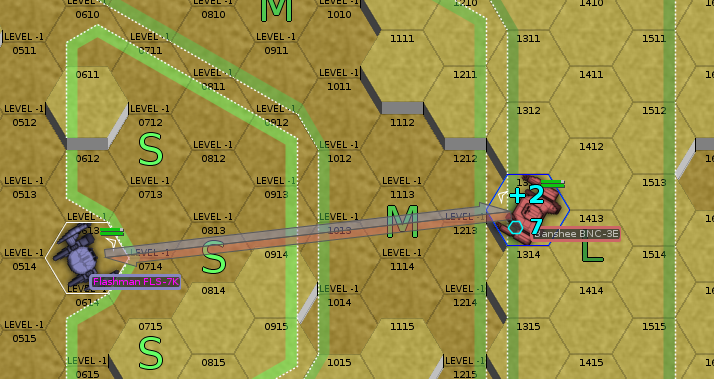 In transit, we get word from the Free Rasalhague Republic intelligence liaison that the Clans have restarted their attacks, and that Stanzach is nearly overrun. They redirect us to Gunzburg instead, and even that isn’t looking like a particularly tenable position when we arrive on December 9. 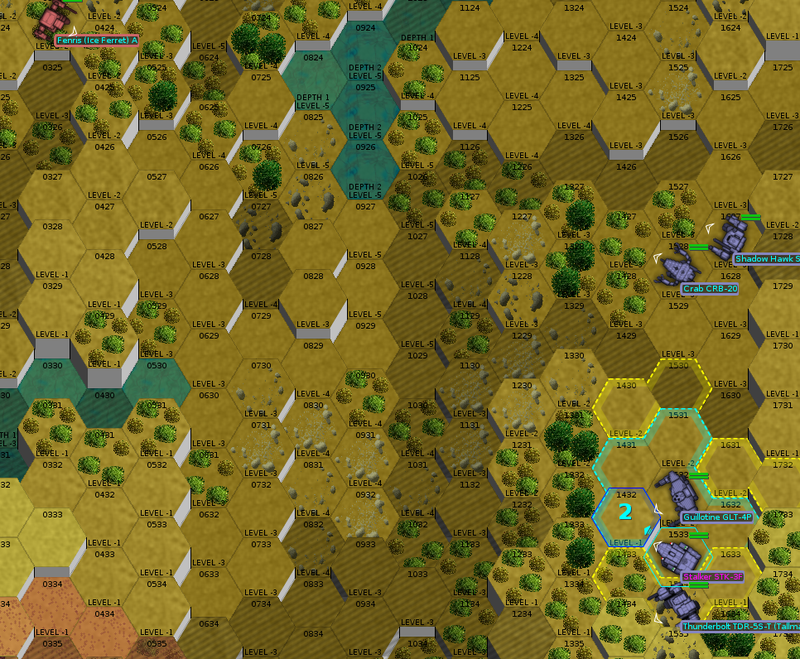 Clan Wolf has advanced as far as Hainfeld and Wheel down to the galactic southwest; Clan Ghost Bear is as far as Alshain on the other flank. We barely manage to land and get unpacked before reports reach us that Clan Wolf has landed on the planet and already overrun the capital. Provided we can survive until Christmas and are willing to fight the remainder of our contract elsewhere, the Free Rasalhague Republic has promised to send a DropShip to evacuate us. It’s a fair deal; we get a free ride back to the front line and keep the generous terms of the contract, and the Republic gets access to four lances of heavyweight mechs with veteran pilots. While the yet-unnamed Second Lance (Rook and company) is patrolling a wooded valley along the edge of our area of responsibility along with our liaison (who drives a Shadow Hawk), they stumble into the first Clan units. There are only four mechs; either a light star or a previously-damaged one. They didn’t call us up to offer a challenge, so presumably they bid for the right to engage us. 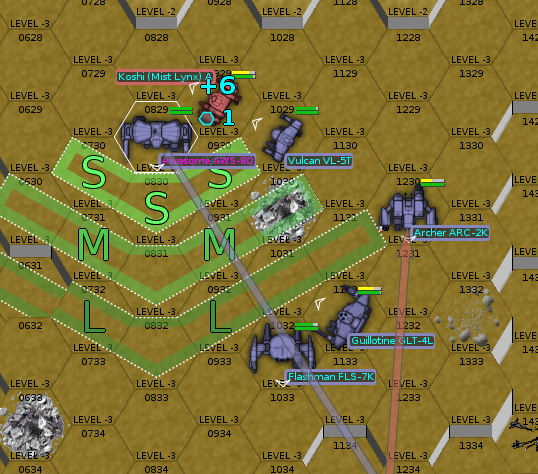 Happily, Drake’s Destroyers are also deployed nearby, and will be able to join us in a few rounds. The map is large and heavily forested, which plays to our advantage. 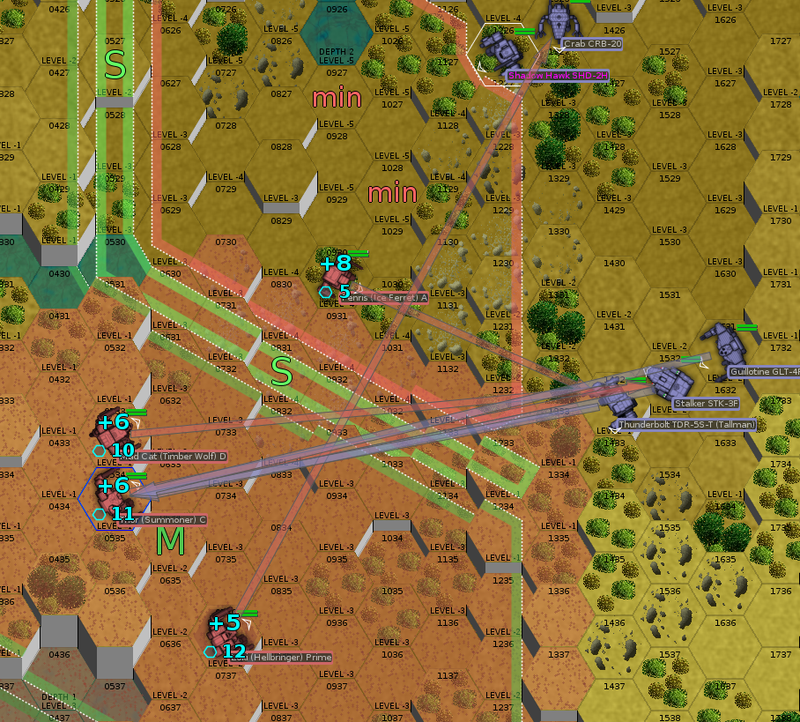 Lots of cover means lots of opportunity to stay out of sight of the heavier Clan units until they get to very short range, where punches and kicks tend to negate their advantages in range, heat management, firepower, and speed. We deploy behind heavy woods in the middle of the map, where the trees will screen us from enemy fire to a degree. 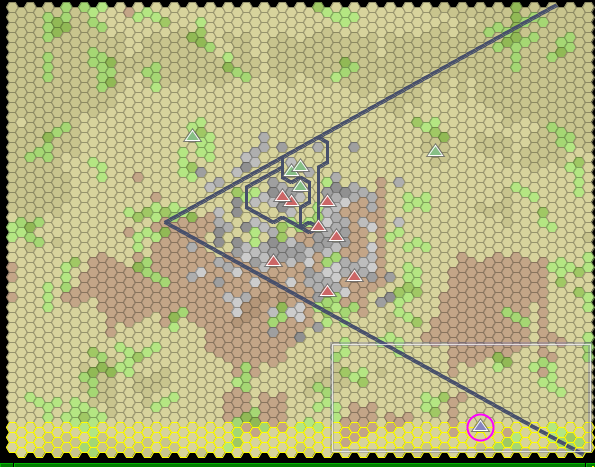 My goal here is to keep the enemy at a distance and shooting ineffectually until First Lance arrives, at which point we can hopefully overwhelm the Clanners. Their fault for attacking without sufficient reconnaissance. More Clanners offscreen to the south. 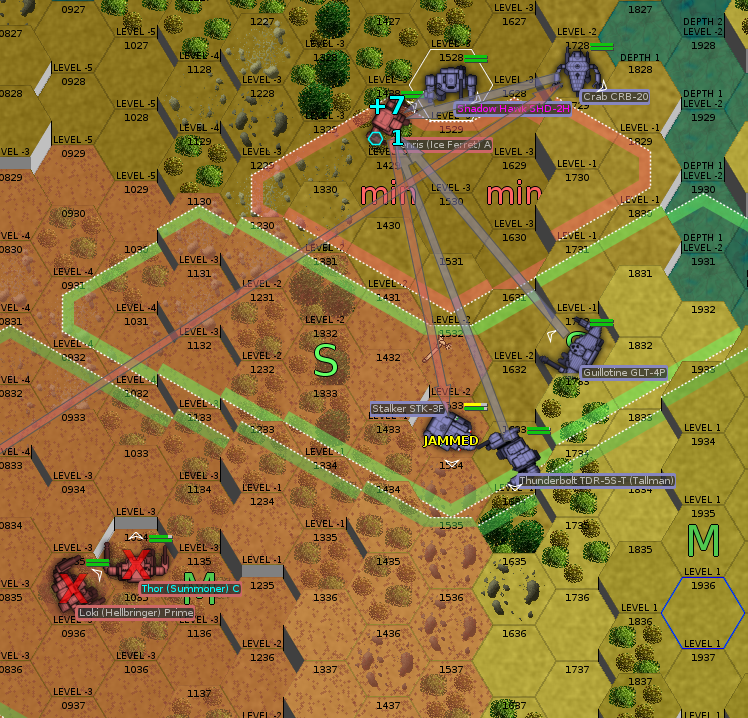 The red hexes are the jamming field from the enemy Loki. Despite the briefings we’ve received, it’s still a little unnerving how much weapons fire comes from just four Clan mechs. Happily, they miss through the trees. Rook lands a few missiles on a light mech running through the trees, and takes a few shots from some kind of cluster-firing autocannon in response. Jockeying for position all around. Rook and Wizard have a decent chance of some hits on a heavy mech our helpful liaison informs us is called a Thor. Rook finally manages to get her Stalker on its feet, and runs it into a dead-end gully where it’s largely safe from enemy fire. Unfortunately, the enemy light mech (a Fenris, says the liaison, and a medium mech in weight despite its speed) has a shot. The rest of the lance can bring some weapons to bear on it, at least, although none has a very good chance to hit. The Fenris remains in the backfield, but doesn’t score any further crippling hits on the Stalker. Rook clips the enemy Thor in the head, but not enough to knock out its pilot. Wizard and the liaison officer’s Shadow Hawk surround the enemy Fenris and both land kicks; it isn’t enough to knock it out or even knock it down. Drake’s Destroyers arrive! By more than doubling the enemy’s weight, we roughly even the odds. The enemy Fenris has snuck around behind the Stalker yet again, a worrying trend, but it’s also been targeted by many of our reinforcements. The enemy Thor is likely going to take a highly destructive shot at Milspec in the Crab, but Rook and Wizard can both take a crack at kicking it, potentially. Drake and Carcer (now driving Rook’s old Flashman) combine for our first Clan kill. Drake lands all three PPC shots on the Fenris, blowing out its remaining autocannon ammo, taking out its left arm, and chewing through its center torso armor, while Carcer cores it with a large laser and medium laser to the center torso. Rook kicks the Thor in front of her, and it falls. This round, we aim to put the enemy Thor in the ground. One way or another, I think we’ll probably manage it. In the south, Drake has a very good chance of hitting the enemy Mad Cat with three PPCs (though, annoyingly, the Clan PPCs do a whopping 15 points of damage to our 10, the jerks). Wizard scores the killing blow on the Thor after Rook softens it up, but not before it’s able to score immobilizing hits on Rook’s Stalker. (She’s still standing, but not able to move or turn.) On the southern front, the enemy Loki hits Double Dog in the Thunderbolt Tallman with two ER PPCs and knocks him over, while the Mad Cat plugs Drake with one. Drake and Carcer prove a solid combination again, knocking out one of the Loki’s PPCs and eating through most of its torso armor. The Loki’s pilot stays on his feet, but the mechs coming down from the north put enough fire onto the Mad Dog to knock it over. Woad, who is driving one of our medium laser boats and therefore leading the charge, is close enough to kick the Loki from one elevation up. He plants his Grasshopper’s foot right on the Loki’s shoulder and shears it clean off. Swarming the Mad Cat, the faster elements from both lances aim to finish it off, or at least cripple it, this round. Rook has managed to get her balance back a bit, and has turned partway around. At this rate, another eight or ten rounds and she’ll be back in the battle. 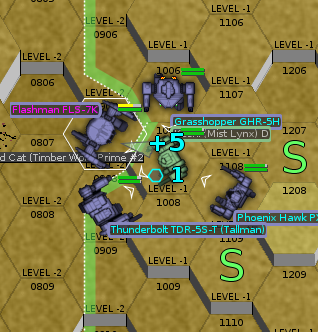 Private Hernandez in the Phoenix Hawk falls over, and neither Clan mech falls, though Drake, Carcer, and Milspec have done a number on the Loki, which is all but unarmored now. Still swarming the enemy. Drake gets his first Clanner kill, punching through the Loki’s center torso armor and knocking out its engine. Wizard and Woad continue kicking the Mad Cat, which is more or less immobilized in a little dip in the terrain. Its right torso fails, dropping the arm off, and its left arm follows shortly after. 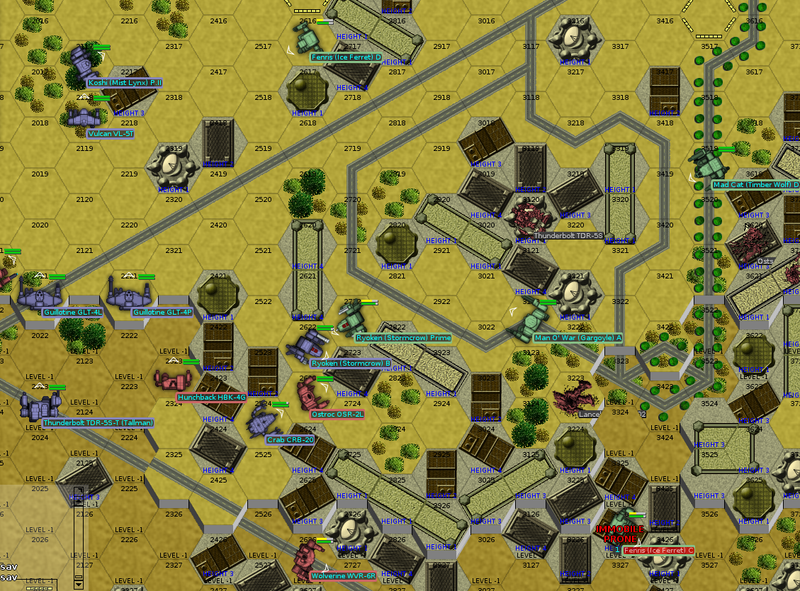 With all six operational, mobile mechs now focusing fire on the Mad Cat, it goes down. Wizard gets the last shot, her second kill of the day. Rough day for the Bastards. The Stalker is a figurative wreck, while the Thunderbolt is a literal one (at least until we order a new head). Carcer, Rook, and Hernandez are lightly wounded. Double Dog is on the brink of death. 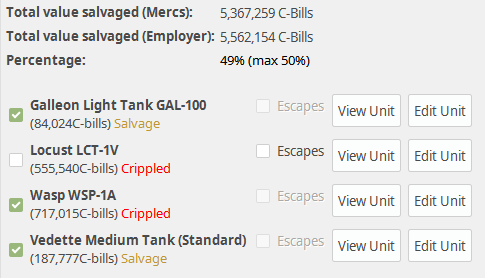 Salvage is a better story. The Fenris, Loki, and Mad Cat all end up in our possession, although we’ll be hard-pressed to strip them before we’re heading offworld in four days. They’re beyond repair, but that’s hardly a great loss; we can’t buy parts to field them anyway. The Thor is a different story. It’s actually functional, or could be restored to function; that puts it well outside of our salvage budget. Wizard is moving up the ranks. It is now December 25, 3051. After radioing the Bastards’ command post to be sure it’s clear enough to attempt a landing, a Rasalhague Royal Army Union touches down, followed shortly after by a Leopard. There are just enough mech bays to fit the active units, and too little cargo space to comfortably fit all our salvage and parts. Our administrators work with the Rasalhague officers to make it work. The men aboard the dropships are ashen-faced and gaunt, and no wonder. The Bastards who choose to wander get the sense this isn’t the first world the Royal Army has abandoned in a hurry, not by a long shot. It hasn’t been a very long war by the standard of such things, but it has been a brutal one, defeat followed by failure circling right back to defeat again. There’s very little of the Free Rasalhague Republic left to flee to. The soldiers and sailors aboard are very aware of that. The more reflective Bastards realize that they got off easy. 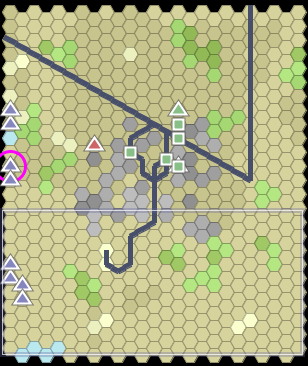 Only the presence of reinforcements turned a brewing rout into a costly victory. There isn’t much worth mentioning for sale: an UrbanMech, a Dragon, and three Wasps. We’ll keep our eyes peeled for better stuff. 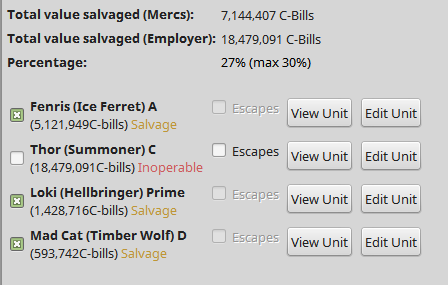 We have 23.155 million C-bills on hand, after purchasing the spare parts necessary to get the unit back into fighting shape. 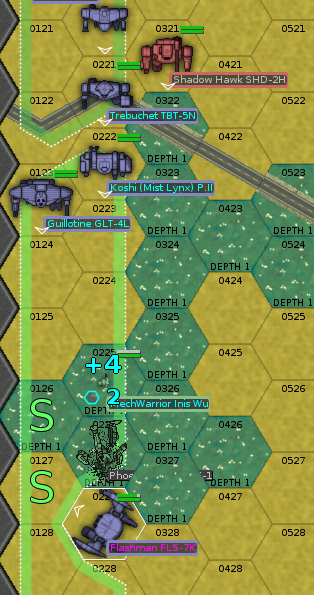 Wojtek increases his gunnery to 4+, the last Green pilot to join the ranks of the Regulars. Ker-Ker and Double Dog have both used 1 Edge at various points in the campaign, and have 1 remaining. All the other claimed mech pilots have 2. Our mechs are back into fighting trim. In the rush, we haven’t had time to fix the paint, so they’re looking a little battle-scarred. We’re en route to Nox. Presumably, we’re honoring the deal we made for evacuation. If we don’t, then there’ll be consequences regarding our reputation. 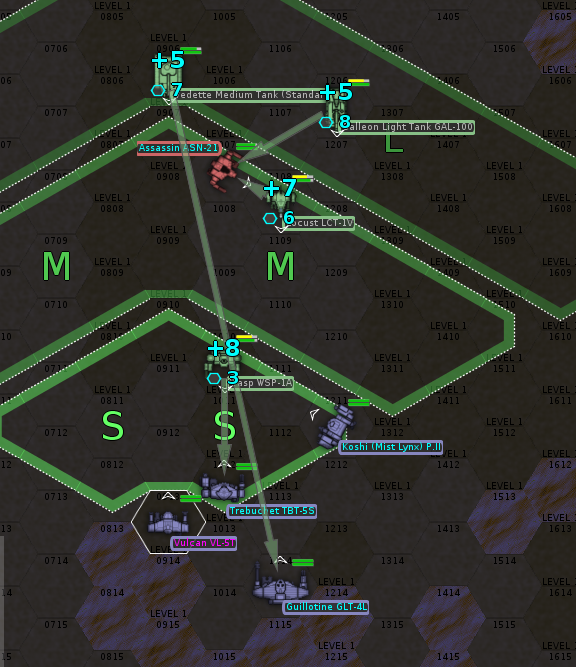 We have some Clan salvage (one ER PPC, two ER Medium Lasers, one double heat sink, one anti-missile system). The Free Rasalhague Republic doesn’t have much left in the stores to trade to us. Other employers (FedCom, the Free Worlds League) may be willing to share advanced technology with us in exchange for our Clan salvage. We can’t just slap the latter onto our mechs; advanced Inner Sphere tech isn’t up to the same standard as Clan tech, but also doesn’t require us to salvage a functioning Clan mech and put it back in service. 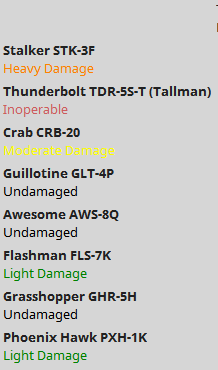 Put another way, should we look to trade our Clan salvage for access to advanced Inner Sphere weaponry, or hoard it and try to assemble a franken-Clan-mech or two? This entry was posted in All and tagged gaming, letsplay, opinionated bastards on March 24, 2018 by Fishbreath.